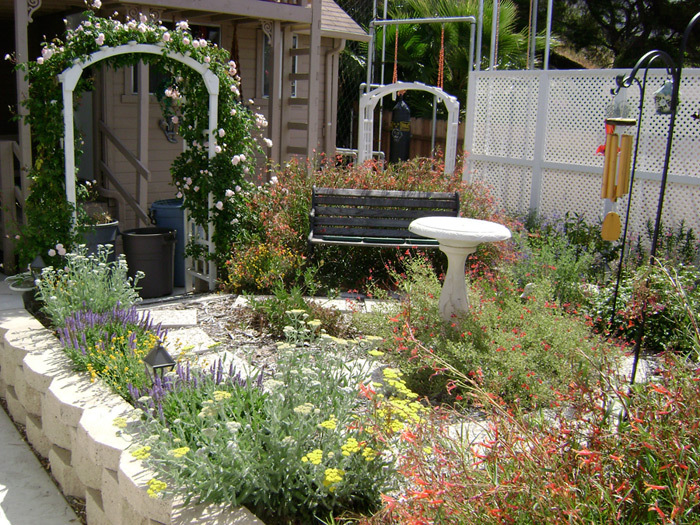 Floral cottage garden focused on butterfly and hummingbird attraction(rose used for 'flair') fifteen months after installation, 2008, San Carlos neighborhood. Rose over arbor is ‘Climbing Cecile Brunner’. Yellow-flowered grey-leaved larger plants on left are Yarrow/Achillea ‘Moonshine’. Smaller yellow button flowered plants on left nearby Yarrow, are Chrysocephalum apiculatum(superb ‘constant’ color performer for this style). Purple flowered plants next to it are Salvia nemarosa ‘east friesland’. Plants around birdbath are Salvia greggii ‘variegated’. Red flowered plants in right foreground and middle background behind bench are Lobelia laxiflora. Drip emitters on blank 1/2" tubing is the primary watering method, with occasional supplemental hand watering. 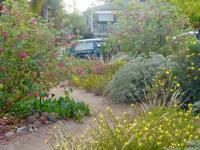 Floral cottage garden, 2008, La Mesa, three months after planting. Composed of herbaceous perennials and annuals, including Lavender, Yarrow, Daisies, Chrysanthemums, Pelargoniums, Geraniums, Plectranthus, Catharanthus, Penstemon, Alyssum, Nasturtiums, Lobelia, Kangaroo Paw, annual Morning Glory, Salvia 'Hot Lips', and more. Irrigation is by adjustable micro-sprays inserted into blank 1/2" tubing which is attached to the 'wavy' fence top by plastic loop fasteners. Other direction from Photo 2. Busy verdant floral woodland, as per client preference, 6 months after installation, 2008, Pt. Loma. Fern on left is Woodwardia fimbriata, small ferns in foreground are Blechnum occidentale, taller silvery ferns are Polypodium aureum, smaller bluer silvery ferns are Polypodium aureum ‘Blue Crisp’ (grows about half the size of standard ‘aureum’), variegated 'Firecracker' Fuchsia in foreground, and elsewhere, non-variegated Fuchsia to the left is ‘Gartenmeister’, some volunteer perennial viola and annual blue lobelia by foreground wall edges, baby tears is the main groundcover, Jasminum polyanthum vine on right, pink impatiens right center, white impatiens with pinkdotflowercenter left center, blue Hydrangea in right background, Malvaviscus arboreus behind Hydrangea. Pre-existing trees: Orange in foreground, Persimmon on right, edible Fig behind Malvaviscus, Magnolia grandiflora in background center, Pyrus kawakamii on left. Irrigation is by both Rainbird spray knozzles on risers, popups, and stationary non-adjustable micro sprays on blank 1/2" tubing, raised by 1/4" stiff tubing. Somewhat wild, rustic orchard, Winter 2008, Pt. Loma, 15+ years after installation. Nasturtiums inward from sidewalk. Pineapple Guava right center, Cherimoyas behind it, yellow Strawberry Guava at left, Loquat behind it, Guadalupe Palm left center. 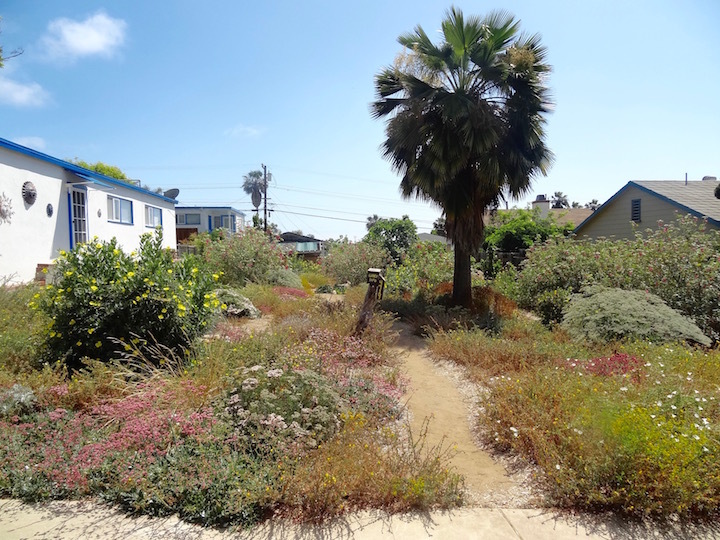 The stylistic idea for the planting of this yard was, in part, inspired by the perspectives of Masanobu Fukuoka, conveyed in his book 'One Straw Revolution', and, to a lesser degree, a Seed Savers Exchange book by John Jeavons. New install. Front yard previously nearly all lawn, taking advantage of the water-smart turf rebate program, in which the property owners receive $2.00 per square foot of turf taken out and replaced with the new non-turf plantings, and such that the new plants will cover at least 60% of the previously turfed area within two years. 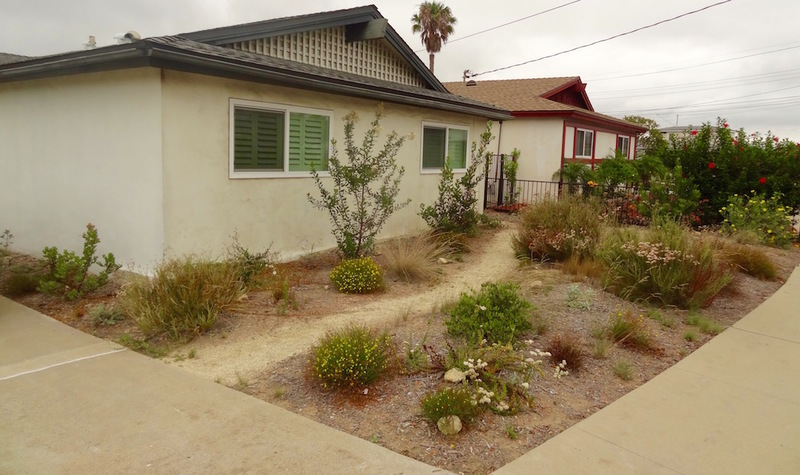 I also did the turf replacement rebate work on the north side of the backyard, which was with fruit trees and flowery-perennial subshrubs, such as Salvia, Gomphrena, and several other genera, though not shown here. The newly installed plants in the photos shown here, though not all are visible in the photos, include: Daylilies, Lomandra 'Breeze', Dietes bicolor, a tree Crape Myrtle, two large shrub Crape Myrtles, five dwarf shrub Crape Myrtles, and in the entry way planter and against the left side fence include Nandina domestica, Azaleas of white, pink, and red flowers, Spider Lilies, Microlepia strigosa ferns, and a Gardenia, all of which get watered no more than once per week only, and only during approximately mid spring through mid autumn, and not at all during winter, for no more than 20 to 30 minutes by dripline irrigation, and that watering plan is likely throughout the life of the landscape. 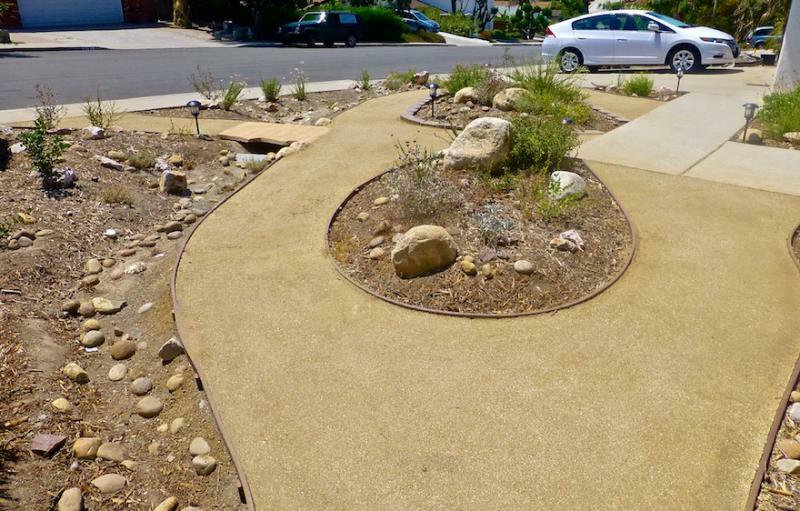 The beige walkspace material is 3/8" Apache Brown gravel which has been compacted, from Southwest Boulder & Stone. The mulch is small deco-bark from A1/Hanson Soils. The irrigation is by 1/4" drip line with emitters at 6" intervals made into a ring around each plant, with water emission rate of about 0.6gph per emitter. The 1gallon size small plants have five emitters in the ring, the larger 5gallon to 24" box have 8 to 12 emitters per ring since they're larger diameter rings. I also reduced-trimmed the existing large tree and cut back the right side fence-hedge of Privet(Ligustrum japonicum texanum) to bare-bones structure about 6' tall, from which to regrow. Summer-Autumn 2015. Photo taken the evening/near-sunset of April 5, 2017, Pt. Loma / South Ocean Beach. 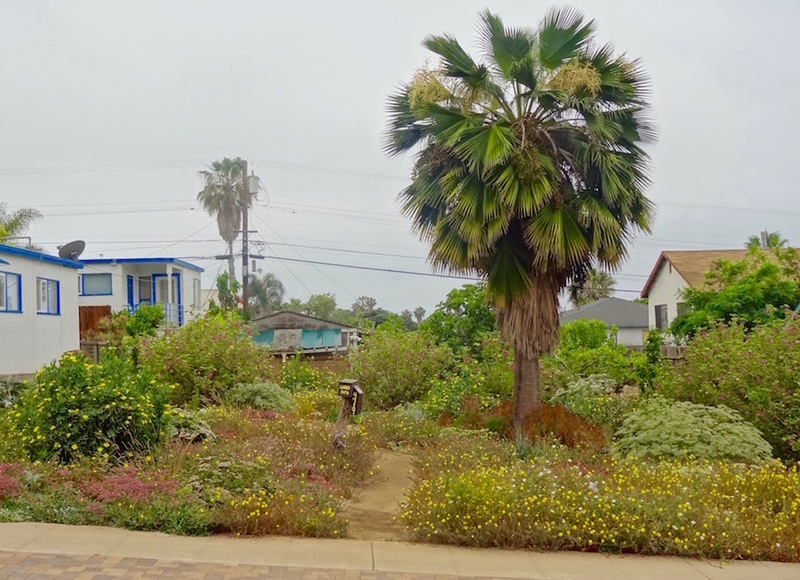 Cottage floral habitat style garden, which is entirely composed of 'Southern California coastal floristic province' natives with most being Southern California island endemics, from Guadalupe Island (the palm tree is endemic there) to San Miguel island. Bush at left is Dendromecon harfordii(island bush poppy), with Calystegia macrostegia (SoCaL native morning glory variety) growing over it, purplish flowers are Mirabilis californica, yellow daisies are Leptosyne gigantea in back by palm, and Leptosyne maritima in front by sidewalk. 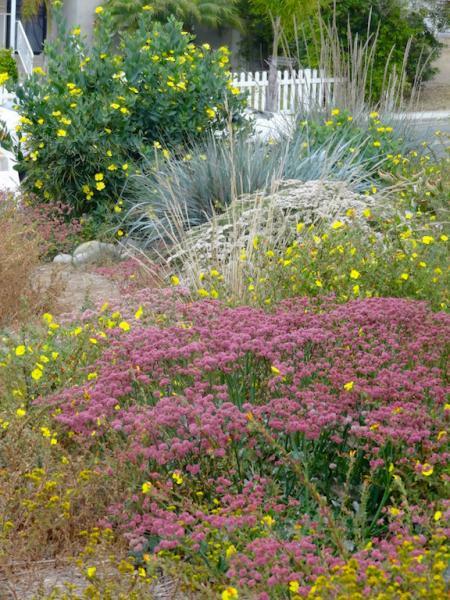 Low growing green-silver plant is Eriogonum grande-rubescens(blooms later spring through summer, pink to red flowers), Eriogonum arborescens at left of center front, and Eriogonum gigantea at right. Stipa lepida grass at left in front of Dendromecon. Tiny white flowers in billowy masses in front of mailbox and elsewhere are Cryptantha clevelandii. Reverse view, from inside garden towards the street. Two weeks later, in the photo below, mid June. I installed, along with labor-helpers, the beige-ish block paving in the parking strip, through the full process of prep, installation, and finishing. Photo below from the following year, 2018, in March. 2018 only had a bit under 3 inches through winter-spring, so, not much garden abundance to show through spring, though it was ok. Supplemental watering was not done, as usual, just rainfall. Dymondia margaretae groundcover growing between marble squares which were already present, January 2009, Mt. Soledad. Installed August 2008. Drip irrigation tubing under Dymondia sod is Netafim brand, techline cv 0.6gpm @ 12" emitter spacing. Pt. 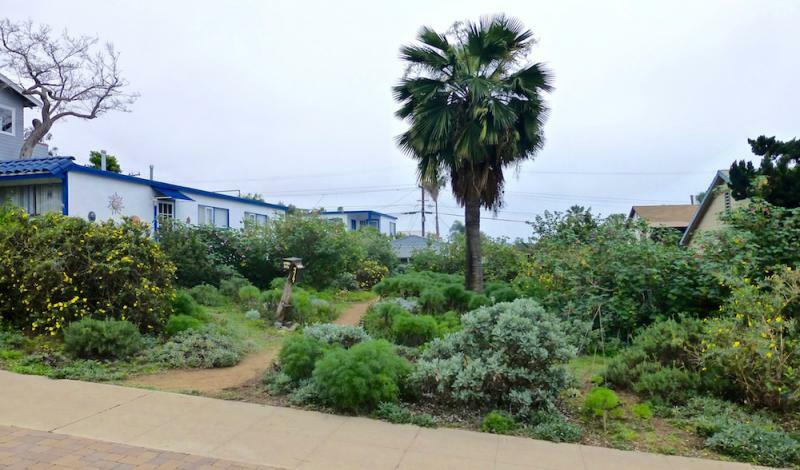 Loma, photo early 2009, after major renovation in Fall 2006, using as much of the pre-existing plants as stylistically acceptable to keep costs on the low side. Lawn and existing irrigation were already present, and remained as is. 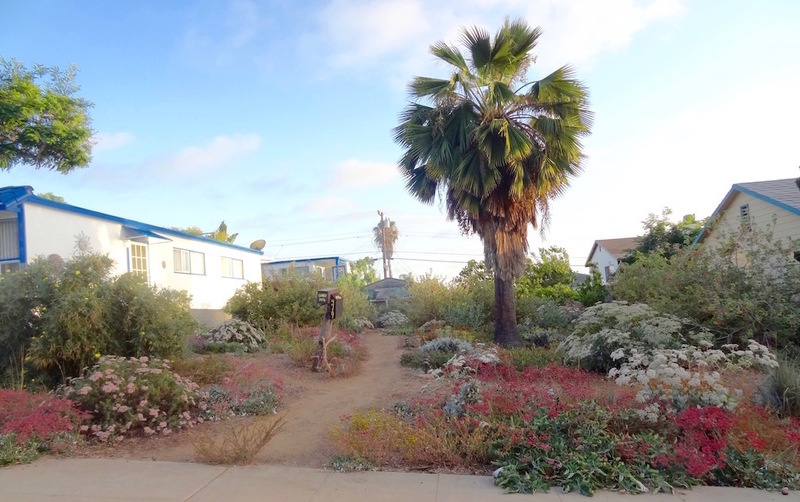 Of the other plants, the Agapanthus, a red Azalea, and a white Azalea - all on the far side - plus Boxwood hedge along property line - right side of photo - were already present, and the bromeliads were pre-existing from the backyard. 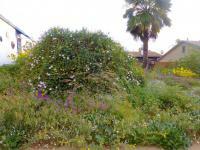 Prior to renovation there were a couple of messy old trees and a messy assortment of other plants. This renovation design is basically a relatively simple, color, structure, and 'ease of growing' 'cohesive collaboration' which was founded upon keeping with the Azaleas and numerous Agapanthus already present(again, both initially only present on the far side). Renovated with Dymondia groundcover(silvery green), red Azaleas(Red Bird), white Azaleas(Alaska), division and redistribution of some of the Agapanthus from the far side put in the near side, Senecio mandraliscae(blue-grey succulent-iceplant) surrounding the Neoregelia(Bromeliads, pre-existing from backyard) in the lava rock beds up front, Aechmea bromeliads - pre-exisiting from backyard - at foundation at right, and two Lophostemon confertus trees(aka: Tristania, desired for evergreenness, ease of growing, and reasonably fitting the landscape aesthetic). The Azaleas are planted directly into the native ground, no amending, just a bit of compost mulch on top to begin with; the soil is readily diggable and well drained. Landscape fabric below the lava rock(front planters). I also did the brick work. Water distribution to the lava rock planters is relatively minimal, and thus the reason for doing it that way - with the 'dryish tolerant' Senecio and Neoregelia. The Senecio 'connects' with the Dymondia, the Neoregelia 'connects' with the lava rock and the red Azaleas, and, of course, red and silver-grey go well together. The Lophostemon 'connects' with all, due to the reddish bark and basic green leaves tending to the light side of green. All together, simple and within budget. Irrigation by sprays, on risers, and rotors on risers, already existing. Photo below showing the landscape in April 2017, 8 years after the click-on photo at left. 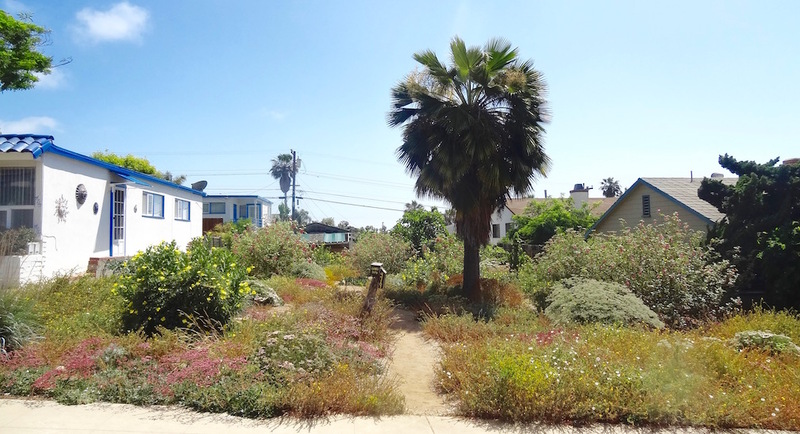 Rolando neighborhood yard, three years after installation. Previously a grass lawn. 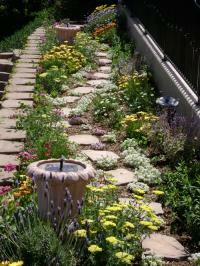 Purpose is low maintenance, simple, and fairly water-wise over the long term and some flowering year-round. Flagstones for pathway and to give some 'slack' to the groundcover for walking on. Groundcover is Dymondia, which gives a unique lawn effect with occasional tiny yellow flowers and needs no mowing, staying about an inch or two in height depending on watering frequency and quantity, and is moderately walkable without damage after some establishment within months. 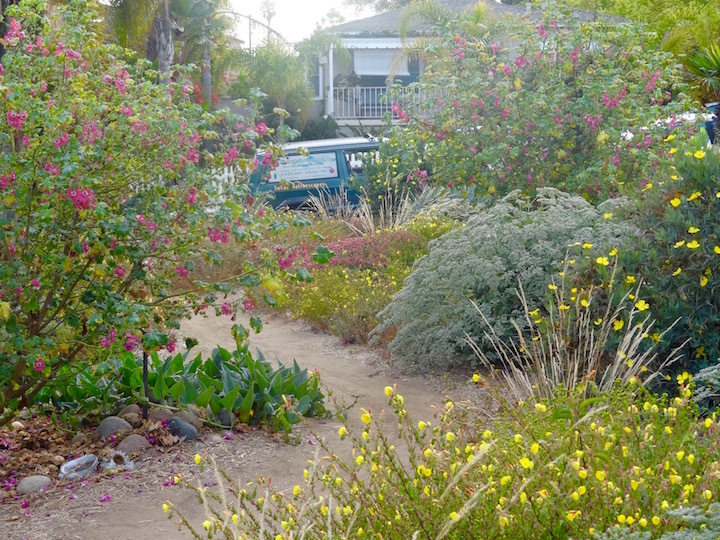 Purple, pink, and yellow Arctotis in middle island; Geijera trees and two boulders(Palm Springs Gold) in middle island; Lavatera maritima at right(which is next to the front door, just out of picture to right), and Rhaphiolepis 'Harbinger of Spring' and Pittosporum tobira 'variegata' at foundation of house. Bougainvillea 'Torch Glow' at base of fence at left. Flagstone is 'Regular Tan'. Boulders and light-beige 1/8" crushed rock(California Gold) from KRC Rock in Lakeside. Irrigation is with Hunter MP Rotator nozzles, - rotary multi-stream multi-trajectory nozzles -, which are the lowest precipitation-rate sprinkler nozzles available, which apply water more slowly and also more uniformly than conventional sprays. And, even though the precipitation rate of the rotator nozzles is 4 times less than (1/4 that of...) standard spray nozzles, it has been found to make the necessary run-time increase for equivalent distribution to be close to '3-times', instead of '4-times', that of standard spray nozzles, due to: 1. the larger streams of water(which are rotating) with negligible misting, at least compared to sprays and other rotors, and hence greatly reducing evaporation and fly-away loss during application compared to standard sprays and rotors of equal radius (though yes, there is the longer run time,.. so, evaporation equivalents would have to be figured to give the fullest true comparison,... but anyway) 2. slower precipitation rate which can make for a more uniform absorption of the water into the soil, and 3. Potentially more consistent uniformity of water distribution(higher distribution uniformity) than sprays, given a same number of heads/nozzles used in a zone. The irrigation controller used is a Hunter Smart Irrigation Controller, with six stations. 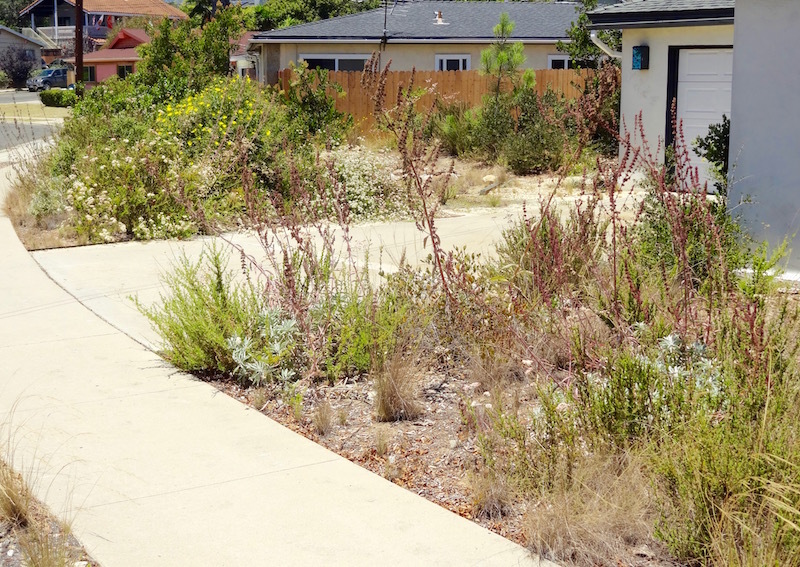 Smart Controllers use sensors and transmitted weather information to automatically manage watering run times to help insure most efficient water use in a given landscape. Also, the Smart Controller cancels the ability of the valves to turn on during rainy weather. Torch Glow Bougainvillea at left, red flowers. Dymondia main groundcover. Foreground 'island': White flowered Gaura. Yellow flowered Calylophus, spot clumps. Yellow flowered Arctotis, main island cover. Young Geijera parviflora trees. 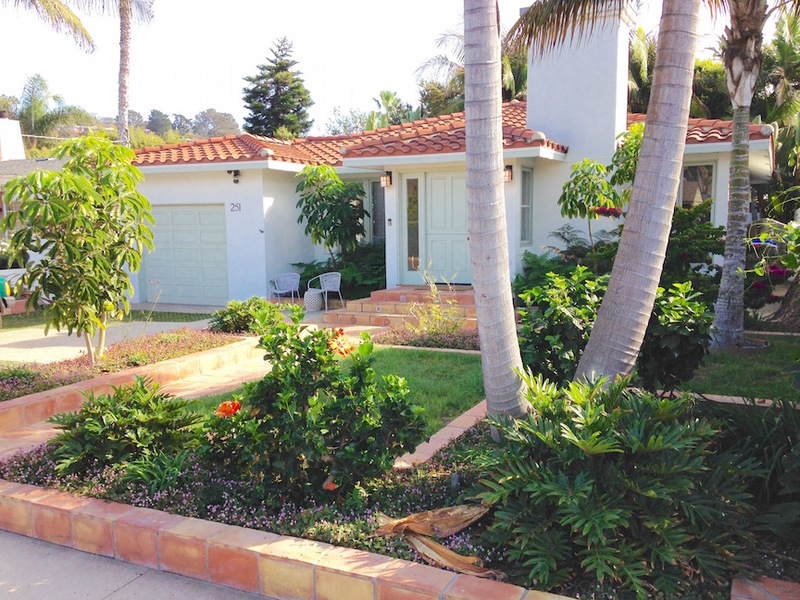 New design install, North Park rental property, October 2015. Basically a no-water very low maintenance plantscape aside from initial watering-in, with select types of succulents. Once per month dry-season watering is helpful though. 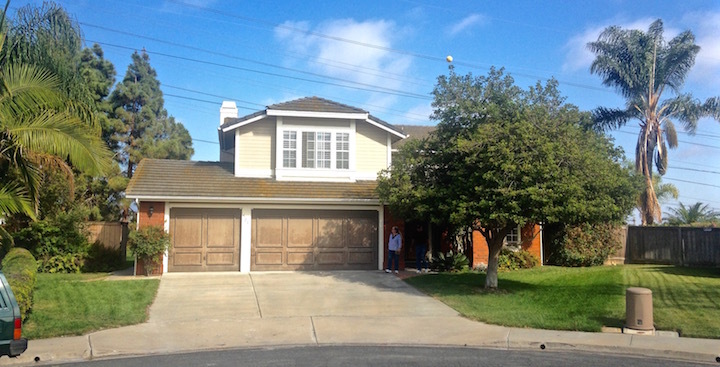 The main space, right side of driveway, was previously a messy semi-turf space, which was dug out three inches deep to make way for the new materials. 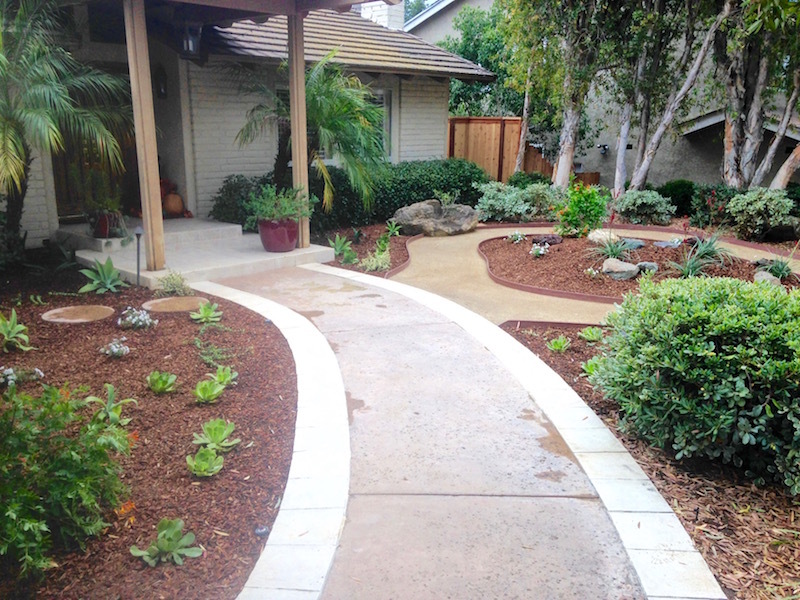 3/8" Apache Brown crushed rock/gravel is the material for the added walk space. 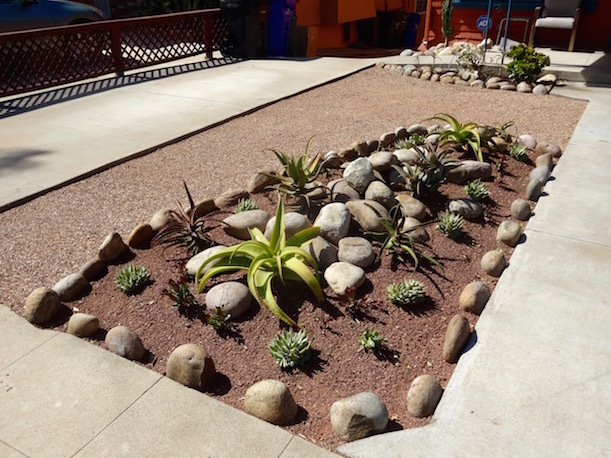 The darker colored mound in the main succulent planting space is Southwest Brown decomposed granite. Both are from Southwest Boulder. The planting spaces have cobblestone which came with the property, pre-existing, and so we used them in making the new design composition. The plants in the main planter are: Aloe vanbalenii(winter-spring bloom), Aloe cameronii(winter bloom), Aloe elgonica(spring-summer bloom), Aloe brevifolia(glaucous leaves, mainly spring bloom, sometimes autumn bloom), and Crassula platyphyla(foliage turns burgundy in sunny dry conditions). Also, except for A. brevifolia, with which the leaves remain glaucous in color, the leaves of the other Aloes in the main planter turn some degree of rouge, from pink to red to light-burgundy, when they become dry for stretches of time. Again, these can all survive in San Diego, in a planted space such as this, on rainfall events alone. No watering needed by other means. Euphorbia pseudocactus is in the square cobble-filled planter space on the left front side of the house, which was previously in a pot which the owner had on the patio. 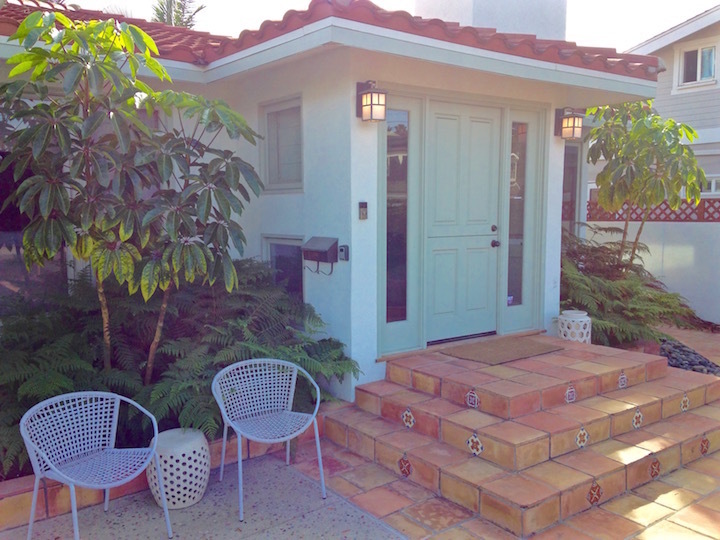 Both sides of the entry are flanked with Jade plants, - aka, the regular 'Crassula ovata'. Also, to the sides of the Jade plants, are small vertical-stalks of an Aloe species from the same pre-exising pot which had the Euphorbia, in addition to a variegated Jade on the left side, and a Jade variant on the right side, which were both also in that same pot. To the right, in front of the house, not so noticeable in the picture, are two young Synadenium grantii rubra, which get burgundy colored leaves with more sun, and with some green variegation mostly on shaded leaves; it can grow to around 8 to 12 feet, though is trimmable to keep it contained and smaller. Succulent(and a few cactus) composition, 'Fiesta Extravaganza' style, 19 months after installation, with emphasis on foliage colors. At least half the plants in this composition are native to southern Africa and Madagascar, and the remainder being native to Mexico/Central America. Over 30 different taxa(species and varieties) are used. The intent is for the plants to, for the most part, grow-in to filling and touching each other throughout the entire planting area within a few years. May and June 2015. The foward portion slightly left of center should be planted with drifts of more of the golden, and, orange, Sedum nussbaumarianum. May 2015. Plants used are: Aloe striata x maculata hybrid, Aloe vera, Agave celsii albicans 'UCB', Agave 'Joe Hoak', Agave titanota, Agave weberii 'Arizona Star', Aeonium 'Sunburst', Aeonium 'Jack Catlin', Aeonium 'Kiwi', Beaucarnea recurvata, Crassula pubescens radicans, Crassula 'campfire', Crassula ovata 'sunset', Crassula ovata 'variegata', Cleistocactus strausii, Cotyledon orbiculata 'white ears', Euphorbia milii 'pink', Euphorbia milii 'variegata', Euphorbia tirucali 'firesticks', Echinocactus grusonii, Graptopetalum paraguayense, Graptopetalum pentandrum superbum, Kalanchoe luciae/thyrsiflora, Mammilaria parkinsonii, Pachypodium lamerei, Pachypodium lamerei 'ramosum', Portulacaria afra 'variegata', Sedum nussbaumerianum 'orange' and 'yellow', Senecio serpens. Summer 2009 photo, near Morley Field, yard section, designed/installed Summer 2007. Regular Papyrus(Cyperus papyrus) with the pom poms, variegated Society Garlic(Tulbaghia violacea) at base, Dymondia groundcover at base, Calla Lily(Zantedeschia) at base, and some red Impatiens at base too. Iochroma cyaneum 'Indigo'(purple narrow tubular flowers) at far right end. Irrigation by sprays on pop-ups, pre-existing. Bed in foreground with: Aloe plicatillis, like a little 'tree'. Aloe 'Blue Elf' on left and right of picture. Aloe brevifolia behind(forward in photo) center of plicatillis. Dudleya hassei on both sides of brevifolia. Aloe 'Donnie' on left and right, other side of boulders, one per boulder. Crassula falcata also other side of boulders, left and right, one per boulder(only a leaf-bit of left-one visible in this photo). All rock materials, - decomposed granite, gravel, boulders -, are Palm Springs Gold from KRC Rock. The d.g. was used to make the mounds; 3/8" rock is about 1" deep; and then the boulders. Irrigation is by micro-stream and micro-spray adjustable emitters, 360° and 180°. Note: This planting was planted in fall of 2009. As of 2011, no more irrigation is necessary, except maybe a bit on the Aloe 'donnie' very infrequently, maybe a few times at the most per summer. Watering the A. plicatillis during the warm season could cause it do poorly or rot. Background in photo 16. Golden barrel cactus and white barrel cactus center area (an especially golden variety, and a white variety, of the species); upright Mammilaria spinosissima at front boulders; Agave parryi 'huachucensis' on right, Agave parryi 'truncata' smaller behind middle boulder; Mammilaria geminispina 'Super Clone' at boulders on right distance; Mammilaria geminispina clump, slightly right of Ag. huac., in line of sight, mostly blocked from sight in this photo, better seen in photo 21; Aloe 'Blue Elf' at right and left sides of photo; Aloe nobilis by A. 'Blue Elf' at left. Aloe dichotoma in center. Euphorbia 'Firesticks' in right distance. Irrigation is by micro-stream adjustable emitters and microspray adjustable emitters: 360° and 180° with both the micro-streams and the micro-sprays depending on position of the individual emitters. April, 2010. Note: This was planted in 2009, as of 2011 they no longer need any irrigation, given the location, the moisture holding ability of the soil, the rock mulch further reducing soil evaporation, and their innate low water needs. Irrigation during the warm half of the year on Aloe dichotoma could cause it to rot or do poorly. South side corridor planting, same property as photos 16 &17, shaded for the most part, and entirely for much of it. Nestled by the house on the left are Sansevieria schweinfurthia, and along the wall on the right are Sansevieria trifasciata, and two tall-ish clumps of Dracaena marginita, - one clump further down the corridor, essentially out of view. Irrigation: two 1gph emitters per S. schw., two 2gph emitters per S. tri., three 2gph emitters per Dracaena, and an additional 180° stream emitter per Dracaena on a separate zone run time that would water every week or two, depending on the weather. The Sansevierias were only watered once initially, then a couple times during the first summer after planting, and basically never again, except for rain, and, the light to moderate seepage that 'drifts' over from the neighbor. Right-side photo of Phlebodium(Polypodium) aureum 'blue dwarf', and red-flowered Malvaviscus. Left photo of a little wall-planter garden with Microlepia strigosa ferns and a mixture of flowers and color: Violas, Hypoestes(polka dot plant), Cyclamen, variegated English Ivy, Pink Clover(Persicaria capitata). Watered by non-adjustable mini-sprays on 1/4" tube risers inserted into 1/2" blank tubing. November 2009. 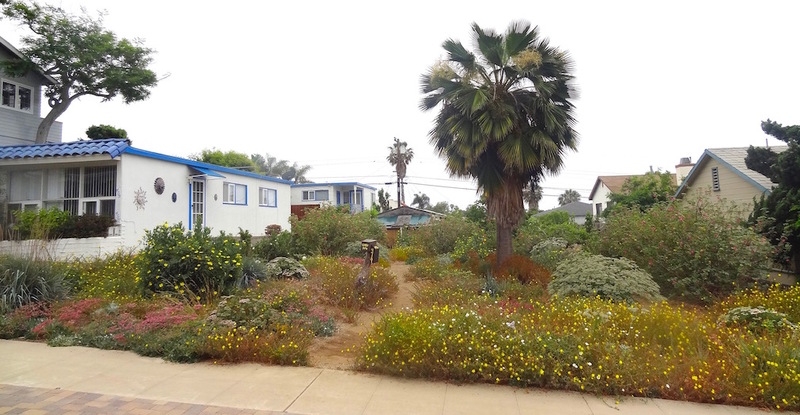 Six years after installation, Southern California coastal native plants habitat style cottage floral garden in Pt. Loma/SouthOB. April 2017. 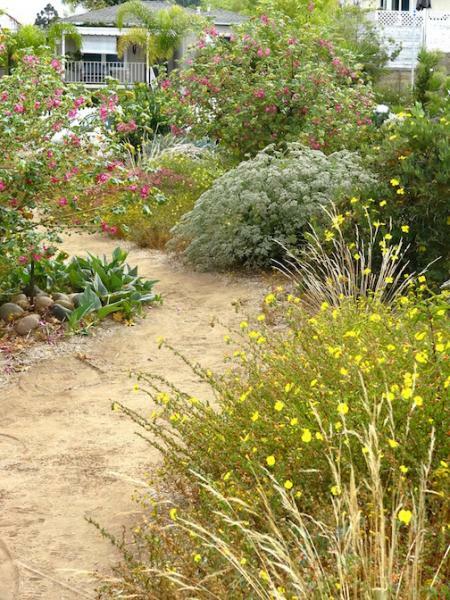 Plants all native to coastal to foothills Southern California and the SoCaL Islands. 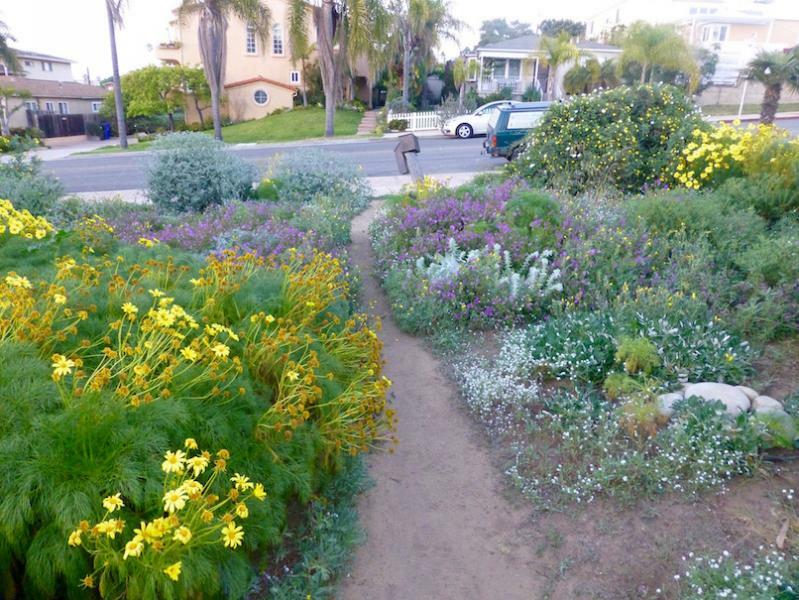 Photo includes: Dendromecon harfordii(bush poppy), Calystegia macrostegia 'anacapa pink'(SoCaL morning glory native variety), Leptosyne gigantea(giant coreopsis), Eriogonum grande-rubescens, Dudleya edulis, Dudleya pulverulenta, Cryptantha clevelandii(white flowers, aka popcorn flower), Camissonia bistorta, Mirabilis californica, Stipa lepida(the grass in front of the big bush),...and further back are Eriogonum arborescens and Toyon. 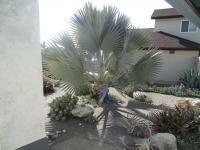 Palm is Brahea edulis, native to Guadalupe Island, which is in the same floristic province. Photo below taken around the right side of the Dendromecon bush, on a sunny morning, different day. In Point Loma. 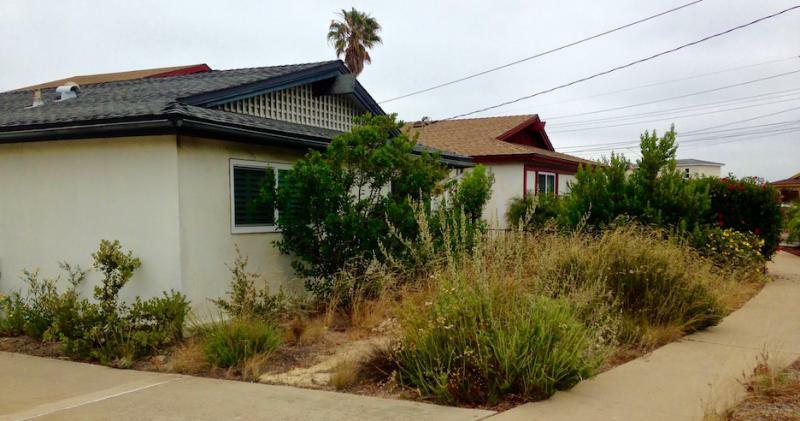 Previously a bare side yard, with vestige of Bermuda grass lawn and Eugenia hedge along the fence. Now composed of: Bambusa textilis gracilis at right, Dymondia for groundcover, one Phlebodium pseudoaureum - blue fern clump. The pavers, which are from Southwest Boulder, are 24"x36"x2", 18"x24"x2", and 24"x24"x2", set on top of masonry sand layer 1 to 2 inches thick. Dark grey-blue 1"-2" Mexican Beach Pebble along house. Installed early autumn 2013, side photo from spring 2015. Photo below is December 2014. Pt. Loma, October 2015. 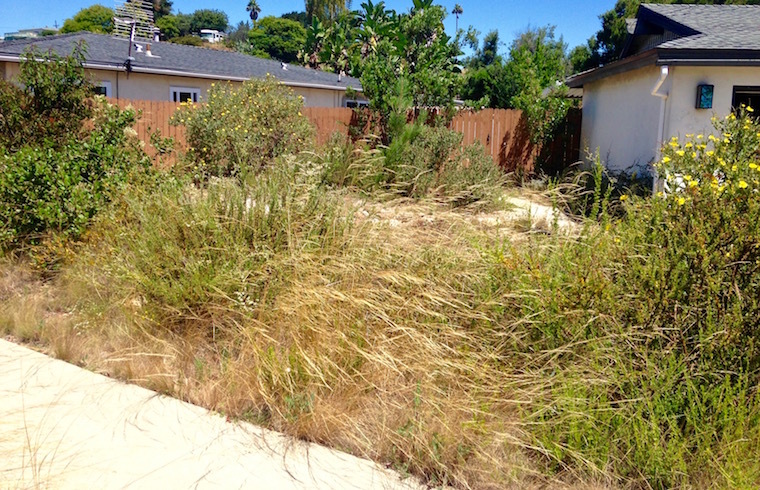 Previously mostly a lawn, two years after the lawn renovation. 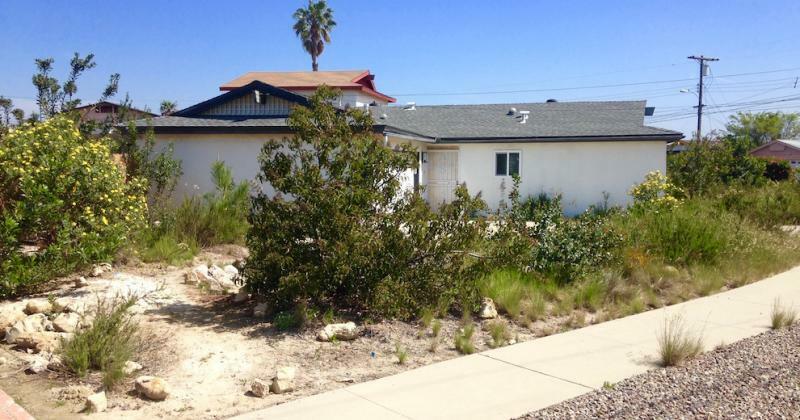 Was done as part of the 'water smart' lawn rebate program, wherein the water authority paid my client/property-owner $2.00 per square foot of lawn which was replaced with the much lower water-use plants. 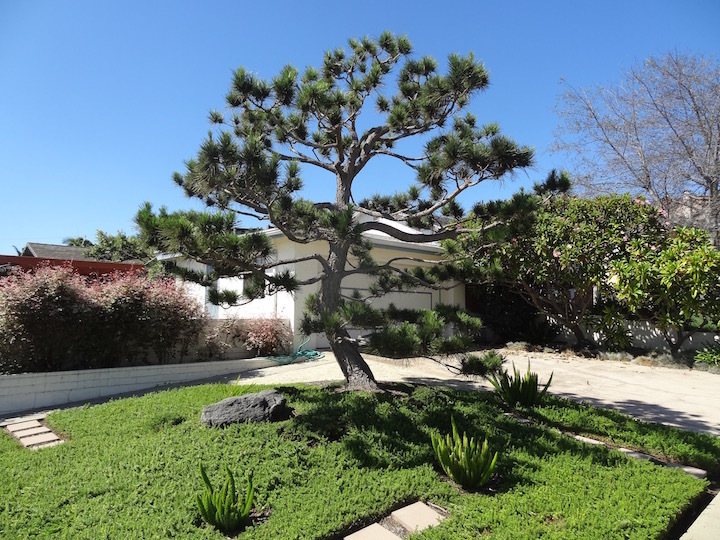 With the exception of an eliptical dirt planting space' around the Japanese Black Pine, the squarish space around the pine was entirely grass lawn. 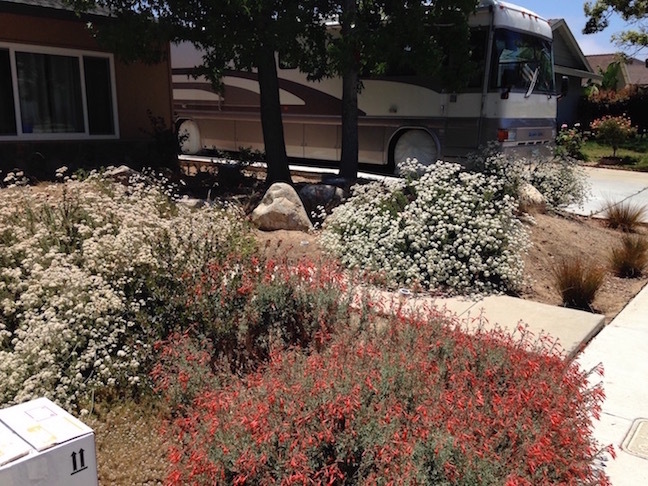 The lawn was replaced with only eight 1gallon Myoporum parvifolium(smaller form of the species, known as 'pink' due to occasional tiny pink flowers), which as you can see, spread quite a lot; plus three one gallon Asparagus 'meyeri' were also installed in the space. 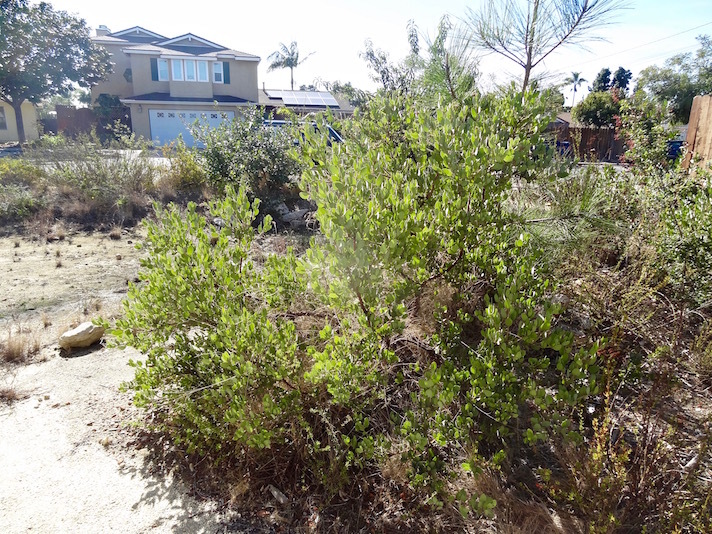 Full coverage of the Myoporum groundcover occurred within one year, though this photo is almost two years after installation. The Japanese Black Pine was also pruned at the time of installation, rather severely, but it can recover as you can see. It was pruned more than it should have, so it's had a slow recovery, but it's doing well and looks good now. 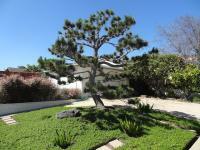 This is the same Japanese Black Pine as in photo 1 and other photos in the Prune/Lace/Shape/Groom photos page. Cottage floral garden 'hummingbird-buffet' of tubular shaped flowers, with Lobelia laxiflora at left, Leonotus leonurus at right, Tree Tobacco(Nicotiana glauca) at right front, red-raceme flowered Salvia at right, Tagetes lemmonii(Mexican Marigold) at right at far end, Cat's Claw vine over arbor and up dwelling. A year and a half after installation, 2009. Drip emitters, 2gph (btw, 5gph would be preferred for broader coverage), on blank tubing is the primary watering method, with occasional supplemental hand watering. Same place as photos 10 and 11, two years prior, early Spring 2010. 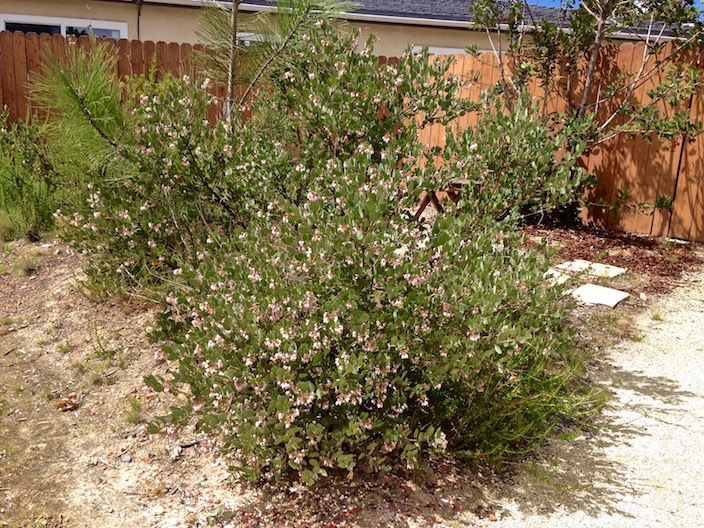 The pink Raphiolepis and variegated Pittosporum together are meant to have a 'neopolitan' ice cream color combo effect, - pink-whitish-yellowish-dark. 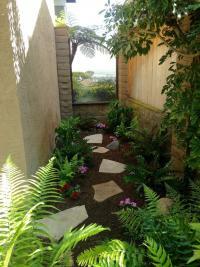 Up the Soledad slopes from Pacific Beach, shady garden with view through landscape window. Ferns are Microlepia strigosa and Cyrtomium falcatum. Flowers are Impatiens. Schefflera actinophyla (young, newly planted) and Schefflera arboricola (mature at right). Summer 2017. Close up showing Salvia canariensis(purplish), yellow flowered silver-leaved Gazania groundcover, and red flowered Salvia greggi(at left along house, flowers too small to show in the photo), yellow flowered 'Moonshine' Yarrow at right, yellow flowered Calylophus left of Yarrow, and miscellaneous other plants in background, including Gaura, Salvia greggi, and more. 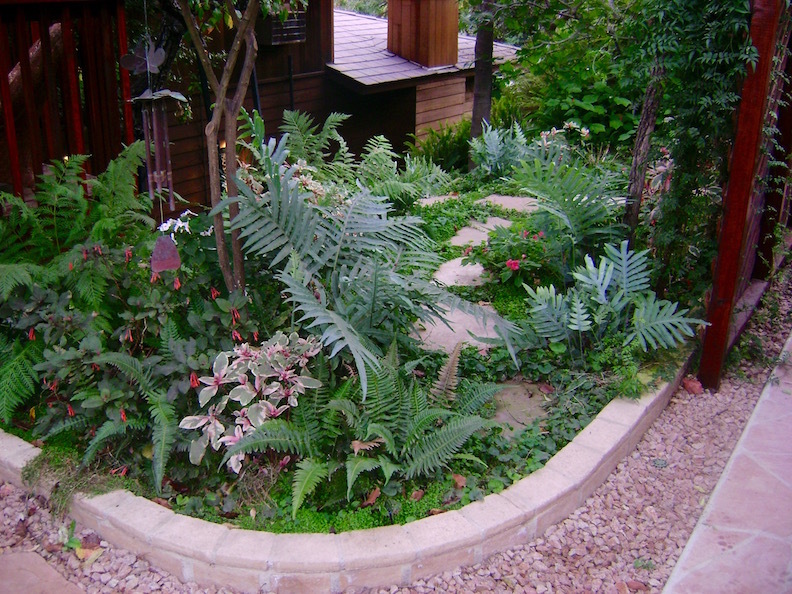 Glaucous-scape, with a few red accents, mostly composed of South African plants. 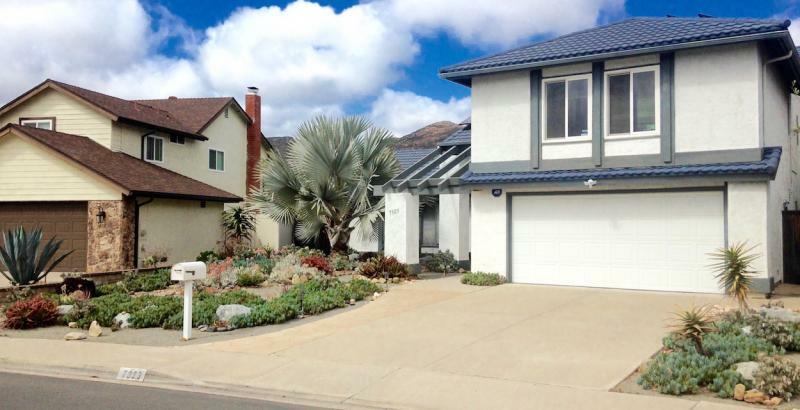 Intended as a very durable, low water use, low maintenance, relatively simple and low budget, moonscape/cloudscape/glaucous-scape that distinctively connects with the white and blue of the house. Plants listed in Photo 31. 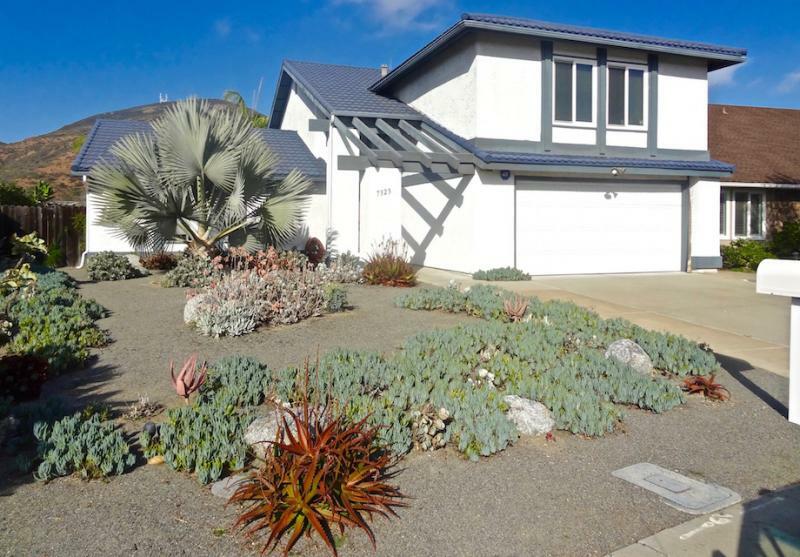 Surface material is the greyish manufactured sand from Gravel'nGrit, and, the salt & pepper boulders are from Alpine Rock and Block, both in Lakeside(not Alpine). Irrigation is by subsurface drip using the new coppershield dripline from Rainbird, which allows for infrequent irrigation due to the copper shielding of the emitters which repels root intrusion, rather than by water super-saturation by frequent irrigation such as daily or every other day as generally required with other makes for root repellancy at the emitter. 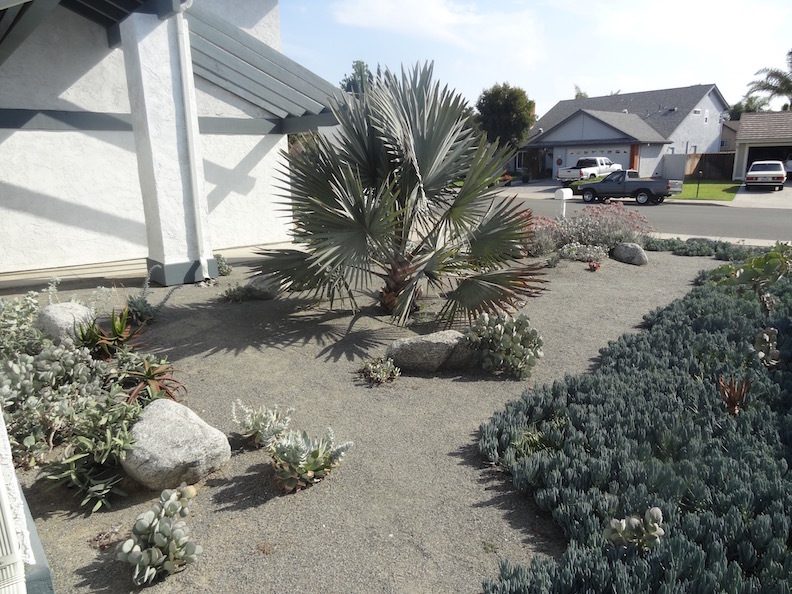 However, except for the palm tree, and the initial irrigation soakings, the rest of the plants will rarely be watered for the rest of their life, because they are so drought tolerant, in addition to the mulching effect of the manufactured sand which greatly helps in retaining moisture from substantial rainfall or occasional hand watering. If the succulents might ever appear to get too dry during Summer-Fall, they'll get watered by shower-watering with a hand held hose. 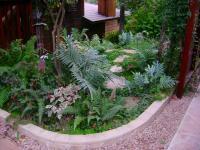 The cycads will be given more water through the dry season, maybe once every two weeks, for faster growth. Because Aloe dichotoma ssp. ramosissima is in the succulent irrigation zone, that zone will not be watered by the irrigation system during the warm half of the year due to ease of succumbing to rot and hence death in warm moist soils. Only if there is very minimal rainfall during winter would the irrigation system for that zone be turned on in late winter to early spring, no more than once, for about an hour and a half, and only for the purpose of boosting rate of growth, since the plants will survive anyway. Typically if the succulents get more water than needed they can sometimes grow gawkily and become less intensely colored in the white and red tones. 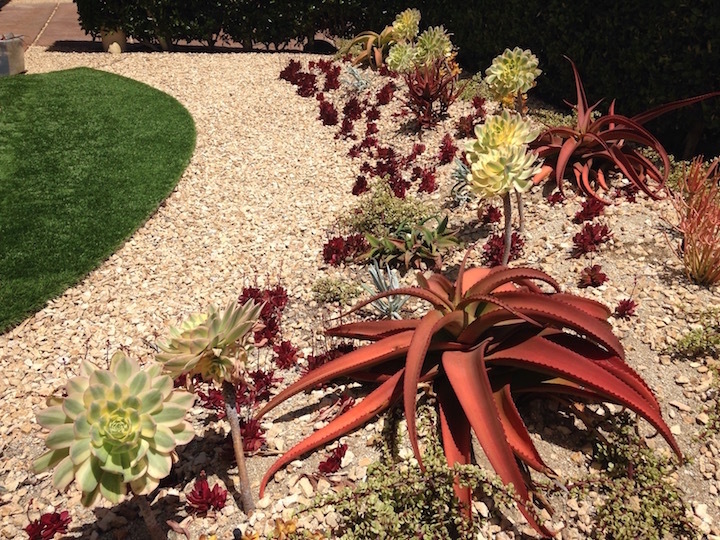 Some succulents can tolerate a fair amount of warm season watering, some succulents don't tolerate as much. Showing the grade level and dripline tubing before putting down the DG-like grey manufactured sand, which is added to about 2 inches thick as shown in Photo 28, and resembles decomposed granite in texture. Pinkish cover pots are for covering a flush valve(front), and both the flush valve and an air relief valve(ARV) in the one by the palm(this one is raised higher for the ARV to function properly, since the ARV needs to be higher than any of the emitters in it's zone to work properly). The pinkish cover pots were chosen because they go best with the glaucous blue, white, silvery colors, compared to the other options available of green or black cover pots. This front yard area has two watering zones / two irrigation valve zones. One for the palm, and one for the rest of the plants. Also, the landscape lighting wire can be seen in the foreground going alongside nearby the dripline. Photo immediately below showing the landscape 5 years after intallation, with a few Aloe additions a few years in. Aloe cameronii (more red), Aloe comosa (pinkish leaves) which goes well with close-color-matching with the pinkish color of Cotyledon orbiculata flowers. The two bottom photos were taken spring 2018. 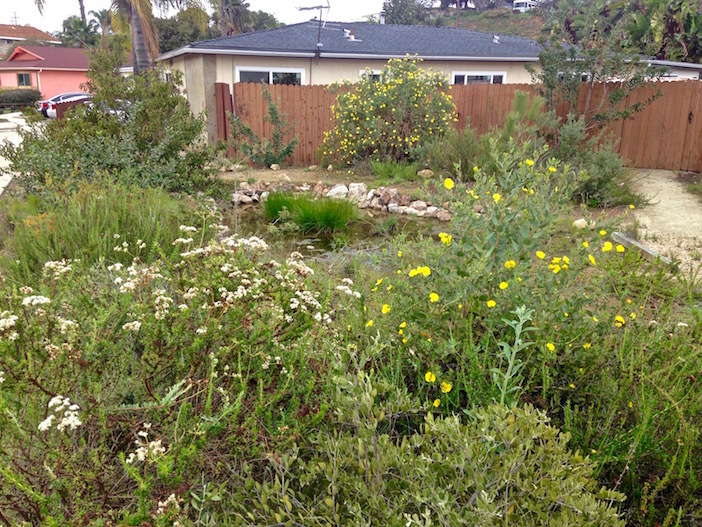 May 2015, five years after installation, near Cowles Mtn. Bismarckia nobilis - palm, Aloe cameronii, Aloe comosa, Crassula arborescens, Senecio mandraliscae blue iceplant, Cotyledon orbiculta of both cylindrical and oval leaf,... the flowers of the Cotyledon and the leaves of the Aloe camosa resemble each other, - a sort of pink to coral-pink,... a nice color play with the grey/white/blue-glaucousness all around. May 2015, five years after installation. Perspective from front door entry. Bismarckia nobilis palm, Crassula arborescens, Dudleya pulverulenta, Aloe cameronii, Crassula falcata, Senecio mandraliscae blue iceplant in background, Agave americana(apparently) in background, Cotyledon orbiculata(both cylindrical and oval leaf,... which are the sproutlings from seed growing around the base of the palm), Aloe cameronii at left - darker leaf. Installed summer 2015, photos 2016. 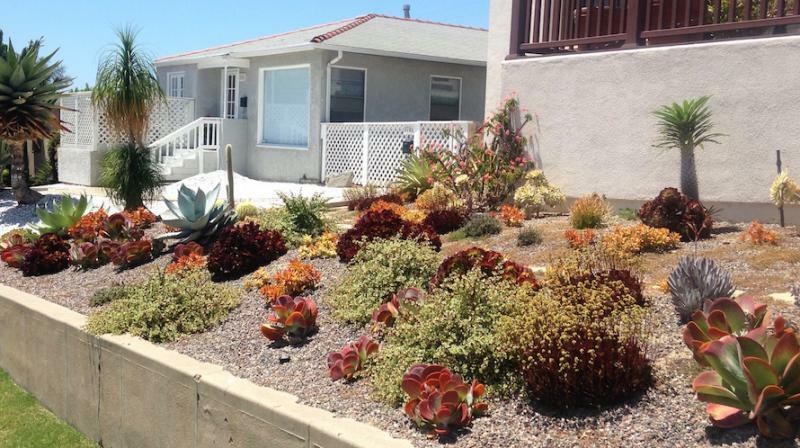 This succulent-plants-island planting will eventually fill-in nearly completely to become a more festive contrasting color display in about one year, using a minimum of materials to minimize cost(i.e. different gravel not used within planting space, different rock border not used/no rock border used). This section was pre-existing as just a flat layer of 3/4" khaki colored crushed rock,... then I raked away the gravel to a boomerang-ish island outline, and then added 5 yards of decomposed granite plus almost a cubic yard of dirt from the backyard, on that raked-away space to make a 'raised island' onto which to plant the plants. The four 'pillar' Aloes are Aloe vanbalenii, which have stalks of yellow flowers in winter. The one Aloe in the center of the curve is Aloe elgonica(in bloom, summer bloomer), and there also five Aloe cameronii(winter bloomer, red flowers) strategically placed, including two on both upper sides of the Aloe elgonica. The light colored leafy-rosettes at the top along the ridge are Aeonium 'Sunburst'; two are also a bit downslope just up from the Aloe elgonica. Portulacaria afra variegata is placed along the top of the ridge in strategic places and on the backside slope of the island. There are two young Euphorbia 'Firesticks' at the top of the ridge at the corner of the boomerang. And the rest of the plants, which are filling most of the forward slopes of the boomerang island are Crassula platyphylla, and Crassula platyphyla variegata. The leaves of those two species color up to burgundy and red-pink, respectively, when let to go basically dry, which they can tolerate quite well, with plenty of sun exposure, and with only occasional lite watering if they shrivel more than desired, if that happens, besides what ever rainfall occurs. When they get significant water, in moderation, they green up and put on more growth. The deeper colored species is positioned all along the front bottom to create a darker 'edge' for defining the boomerang island, instead of spending more money in buying rocks and the time in detailing that all nicely(likewise with using a different gravel/pebble for the island surface,... but the plants will fill it all up, that's the intent with this composition). Those Crassula are sold in one gallon containers which have about 8 to 10 individual plants which are each rooted and can be easily separated, and hence a savings of cost in plants per unit area. 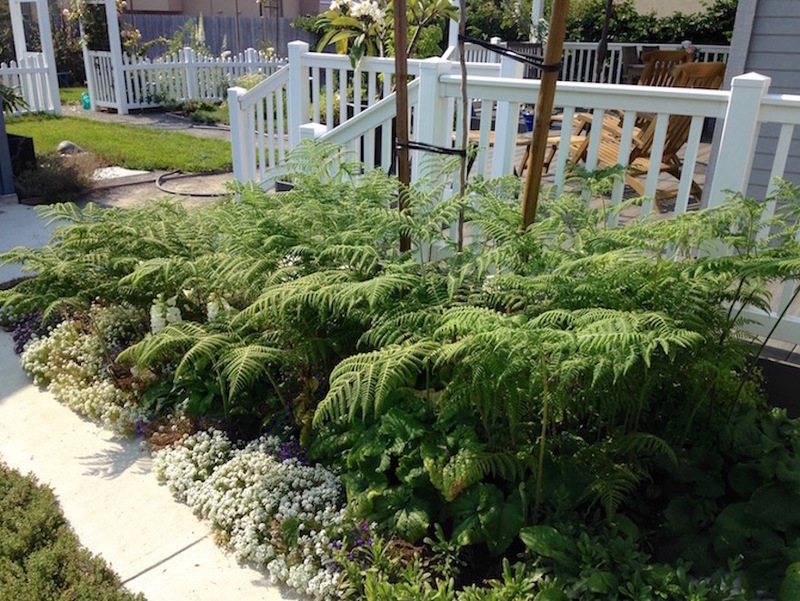 The general idea with watering, to keep things looking fresh, and still colorful enough, is to modestly water by hose spray about once per week. Hypolepis punctata ferns, in a sort of modest cottage floral character landscape. Hypolepis punctata does excellently in sun, with moderate water. Landscape already installed by another contractor and the home owners, and I just have done some retrofitting/upgrades and select-trimming on some shrubs/trees in this landscape. This photo just shows one bit. Normal Heights, 2017. 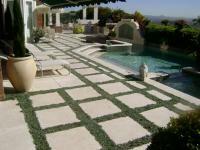 Previously a pool, converted to a rose garden. Pool was filled with dirt by another contractor. 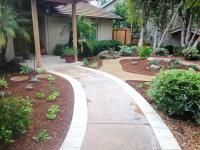 And I did the rest of the work, including path design, pink DG, and mulch. New design-install, the roses are planted bareroot with nursery plants and with bigger container grown plants already growing at the property for some years. The pathways are made of pink decomposed granite, from KRC Rock, a few inches in height and about 20 inches in width. The irrigation is with 1/4" tubing circles with 10 emitters each at 6" intervals with emission rate of about 0.5gph, so about 5gallons per hour per 10 emitters. Each 'circle' is connected by a blank 1/4" tube that connects to the bland 1/2 drip tubing which is along the entire perimeter. Valve is next to house. 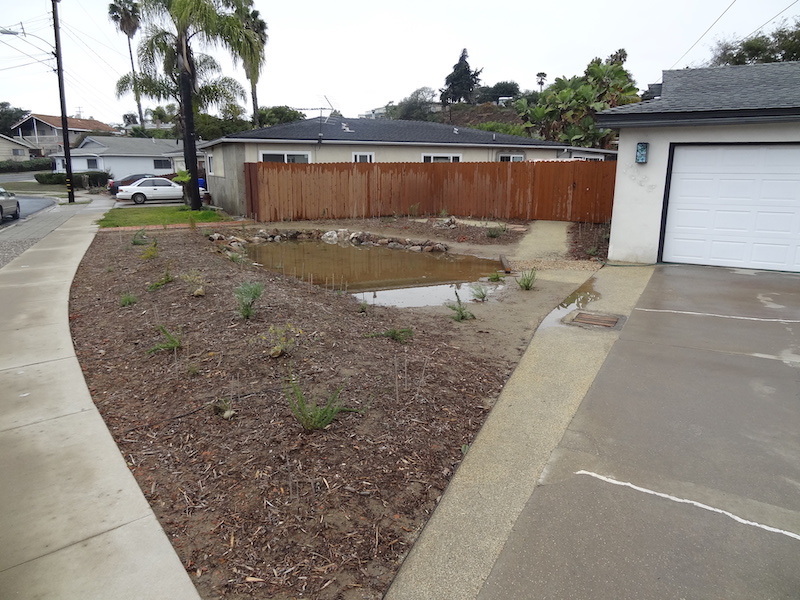 Photos below are one month after installation, February 2014. The photos above show it 3 to 4 1/2 years later. The mulch is the 2" mulch from Miramar Landfill, installed at approximately 50% density not more than about 1" thick. That's what I describe as a 'habitat style' mulch density for a general coverage. A little more density is put immediately over the rootballs of the installed plants and a little beyond the rootbalsl, though the thickness is still the same, 3/4" to 1". The only irrigation used, which was to get the initial establishment in the first year to two years, depending on the particular plant and position of the plant, was only with adjustable spike emitters, which are made by multiple brands, and which are connected by 1/4 blank tubing which are connected to 17mm diameter blank tubing, which is approximately 5/8'' diameter. 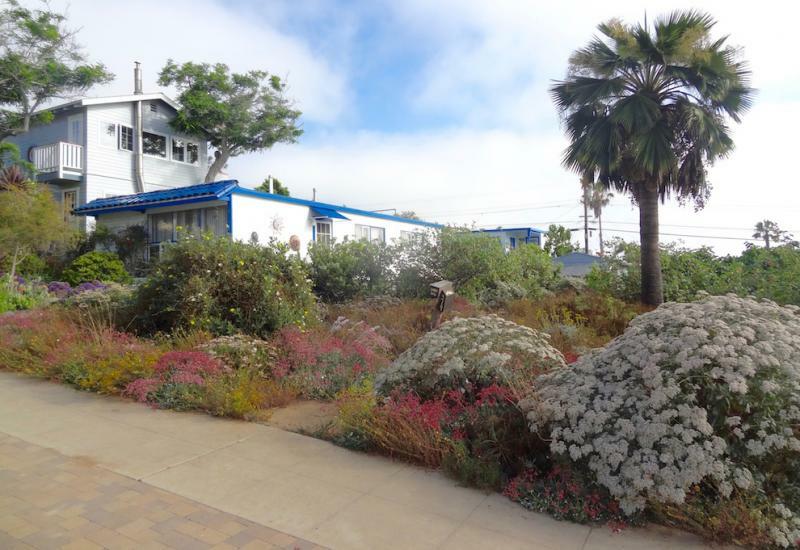 Photos below, Feb./March 2018: showing off the bush form of Del Mar Manzanita, in bloom(flowers) in the top photo below, with a Torrey Pine, some local Buckwheat, local Stipa lepida grass, and assorted other local natives. Photo below shows Del Mar Manzinata with Dendromecon rigida on the left (Dendromecon rigida, - aka mainland 'bush poppy'). 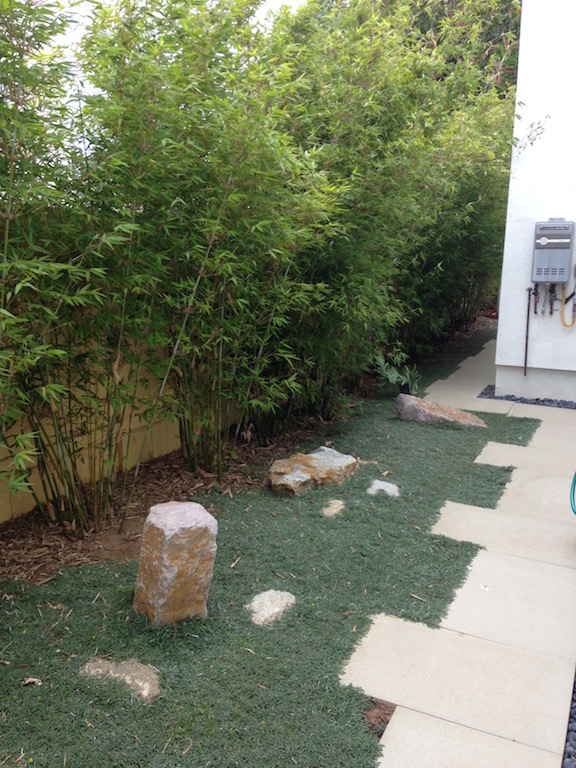 Water$mart, turf replacement rebate program project. 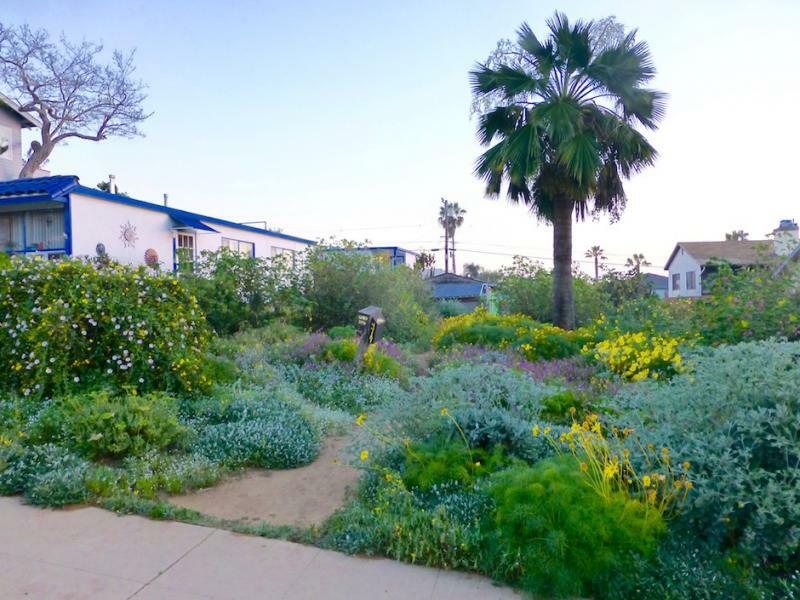 Formerly a front yard lawn. 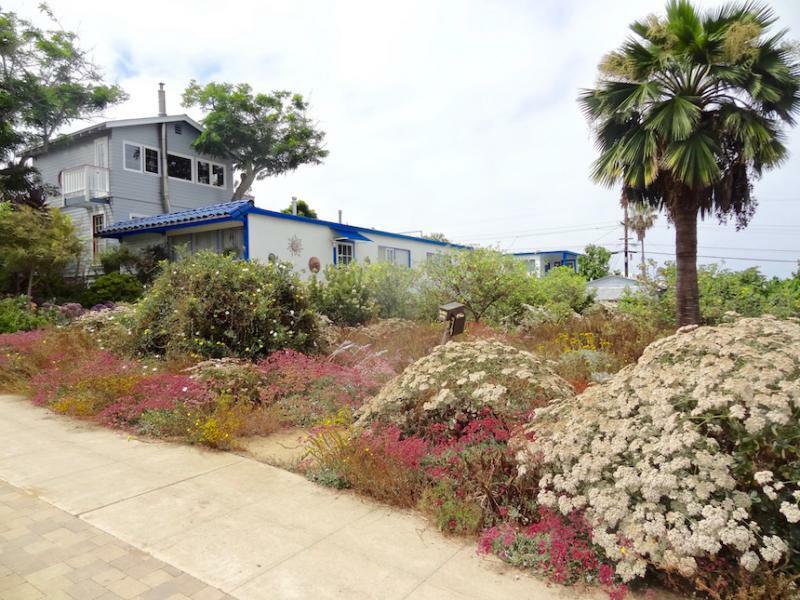 Planted with a variety of Aloe harlana(yellow flowers, speckled leaves), Balcon Pink Ivy Geranium, After Glow Echeveria, Agave attenuata, Giant Bird of Paradise, and blue Polypodium fern(below the pre-existing Schefflera arboricola along the house). Irrigation was retrofitted with adjustable 360stream-emitters connected by 1/4" tubing connected to 1/2" tubing. Carlsbad, spring 2015. Spring to mid-summer is the main 'show time', though with adequate rains it can begin to take on a full character by early winter, and carry on a varying good show through mid to late summer. Fall time is a relatively dormant 'down time'. Part of 'the show' is from annual plants and fresh-n-floral growth flushes, which get cut down in fall as they go dry or get tattered. 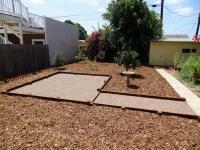 This is the same yard as in picture 5. 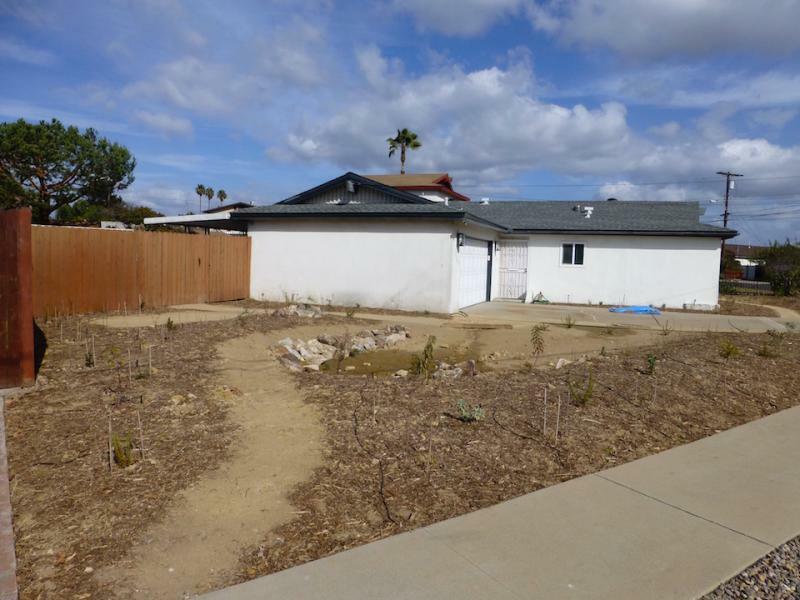 The previous plants in the forward half of the yard were taken out except for the palm, and a layer of dirt throughout that area about 4" to 6" deep was also taken out and hauled away, which took the vast majority of the weed 'seed bank'. But there were still a fair amount of weeds that came up afterwards, of which were either pulled, dug out, or hula-hoed when they were very small, soon after sprouting. Some weeds have come up each year, either old seeds from the 'seed bank', seeds getting tracked from the back portion of the yard where other things going on, some that have been 'missed' and have gone to seed, and possibly some blow ins. Starting late 2014 some herbicide spray is being used for controlling a fair amount of the lambsquarters(Chenopodium), sow thistle(Sonchus), and some others which pop up. Spot spraying is all that's done, though any saplings of Malva assurgentiflora which sprout beyond the dripline/canopy of the parent plants are sprayed also, more so en masse, though some are pulled. 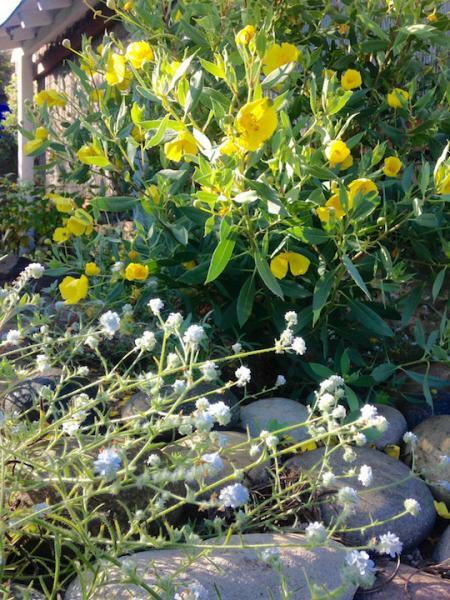 Yellow flowers in front of left photo are Camissonia bistorta, aka 'foothill suncup'. Island endemics: Ceanothous arboreus, Dendromecon harfordii, Epilobium 'Catalina', Eriogonum arborescens, Eriogonum giganteum, Eriogonum grande rubescens, Galvezia speciosa(glabrous and tomentose), Lavatera assurgentiflora(and subspecies glabra also), Leymus condensatus 'canyon prince', Perityle incana, Verbena lilacina. Both islands and mainland natives: Calystegia macrostegia ssp. 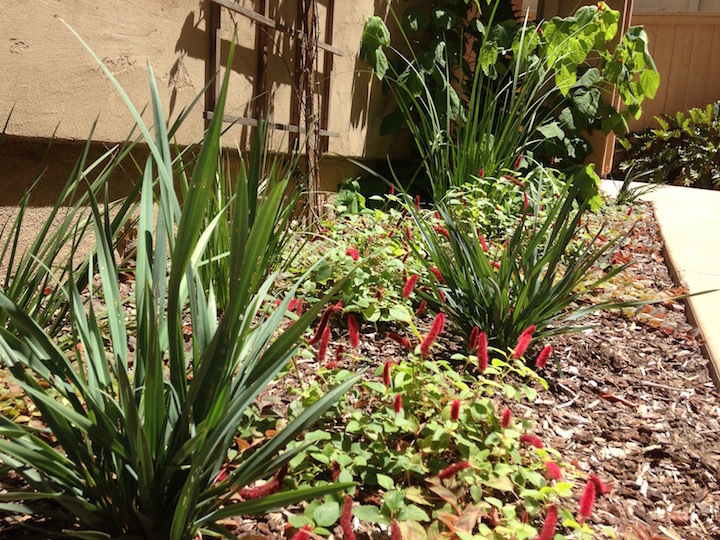 macrostegia, Camissonia cheiranthifolia, Constancea nevinii, Cucurbita foetidissima, Datura wrightii, Diplacus puniceus, Dudleya brittonii, Dudleya pulverulenta, Encelia californica, Heteromeles arbutifolia, Isomeris arborea, Keckiella cordifolia, Marah macrocarpus, Mirabilis laevis/californica, Prunus lyonii. Mainland only: Calystegia macrostegia ssp. arida, Camissonia bistorta, Comarostaphylis diversifolia ssp. diversifolia, Dendromecon rigida, Dudleya pulverulenta, Eriodictyon crassifolium ssp. crassifolium, Penstemon centranthifolius. 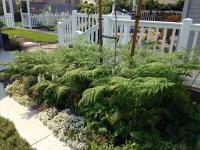 Initial planting was spring of 2011, with some plant subtractions and additions since then. Dudleya brittonii in front, Dendromecon harfordii(island bush poppy) yellow flowers behind Dudleya and right back, Camissonia bistorta(foothill suncup) - the other yellow flowers, Mimulus aurantiacus red flowers behind front Dendromecon, Eriodictyon crassifolium behind Mimulus, Eriogonum giganteum at left in pre-bloom bud stage, Calystegia macrostegia ssp. arida below the Eriogonum, Leymus 'canyon prince' (blue wild rye) at right, Mirabilis laevis, bush form from north Baja, at left diagonal behind of forward blue wild rye. Early June 2013, - 14 months after installation. Both photos late June 2017. Baypark, 2016 installation, photo 2017. Myself, and helpers, installed the roundabout with the edging and decomposed granite, and the new plants with the mulch around them. 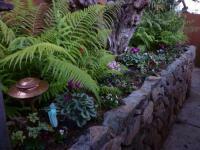 This was an already established landscape which we did some changes to. 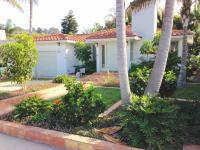 The main shrubs, the trees, the palms, were already present. 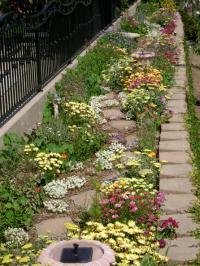 Cottage floral garden, low water, with some colorful succulents in the front edge. The succulents are Portulacaria afra variegata and Crassula ovata 'Sunset' aka 'Hummel's Sunset'. Other plants include: pink Gaura, pink Ivy Geranium, Euphorbia lambii, Echium fastuosum variegatum (in back area), Aeonium 'Sunburst (in back area), and Euphorbia 'fire sticks'. La Jolla, 2017. Little condo garden, with trailing Acalypha pendula (red flowers low spreading), Dianella caerulea 'cassa blue'(lower grassy in foreground), Dietes bicolor (taller grassy), Distictus buccinatoria, Malvaviscus arboreus, Phlebodium aureum, and some minimally visible Persicaria capitata (low spreading, aka 'pink clover'). Hillcrest, 2017. 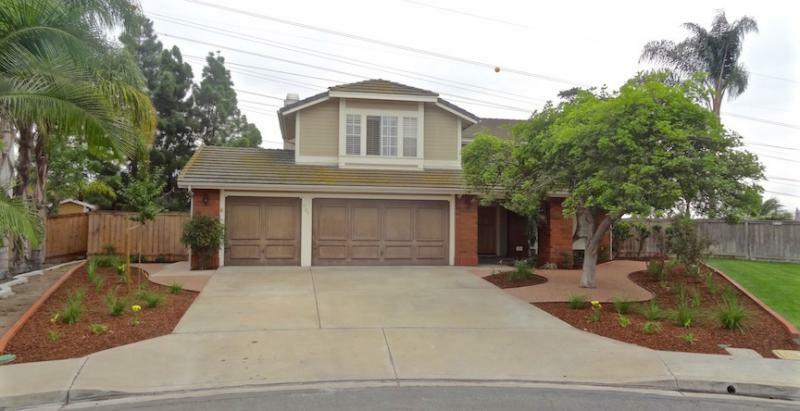 New design-install in San Carlos neighborhood, summer 2012, near Cowles Mtn., - though with the Olive tree in middle and Pyracantha screen at right previously existing. The space was previously a lawn. The cobble stones at the base of the Olive tree are from digging out of the ground for the irrigation system and planting plants. Desert Gold decomposed granite is used for the raised pathways(from RCP Rock) with Autumn Gold flagstone(from KRC Rock) settled halfway into the DG. The DG is about four inches higher than the base soil level. The mulch is the minimum grade mulch (sometimes known as 'free mulch') from the Miramar Landfill, laid about 2" thick (although only 3/4" to 1" is, as I've found, preferable maximum, with partially see-through density, for this kind of mulch, since thicker may tend to cause newly planted plant stunting to due naturally occurring 'growth retardants' in this mulch) , it's composed of random residential and municipal plant shreddings mainly composed of 1/2" diameter by a few inches long and smaller plant pieces/particles and a fair amount of 'fines'. 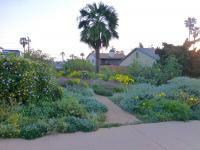 The native plants which were planted here never really thrived in this space. The species included, Eriogonum fasciculatum, E. arborescens, and E. giganteum, Leymus 'canyon prince', Epilobium californicum, Comarostaphylis div. div., and even Oenothera elata, surprisingly didn't do well. 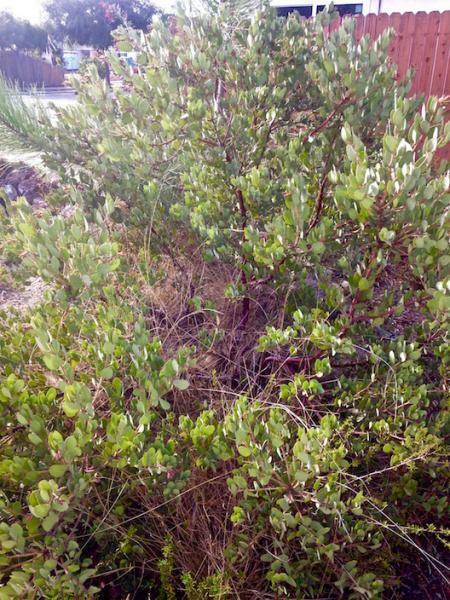 This mulch is not recommended to be used for young plantings(even though it is here shown in the photo), since it seems to cause stunting/slow development of newly planted plants which aren't of a particularly tough character due to apparently naturally occurring growth retardants in the partially decomposed mixed-municipal plant materials which, when watered, exude growth-inhibiting 'exudates', especially from the 'fines',... like with coffee grounds or some teas, it leaches out more easily when more finely ground. Although, that exudate quality also causes inhibition of weed development, though weeds will still grow a fair bit, though maybe less so than typically. Also, the competition from the established roots of the Olive tree and Pyracantha is the possible or probable main reasons for the stunting and difficulty for the native plants to thrive, plus the 'nature' of the soil which was previously a lawn, which could've had some problem issue about it, though the lawn seemed ok, not great, and which was mostly Kikuyu grass. 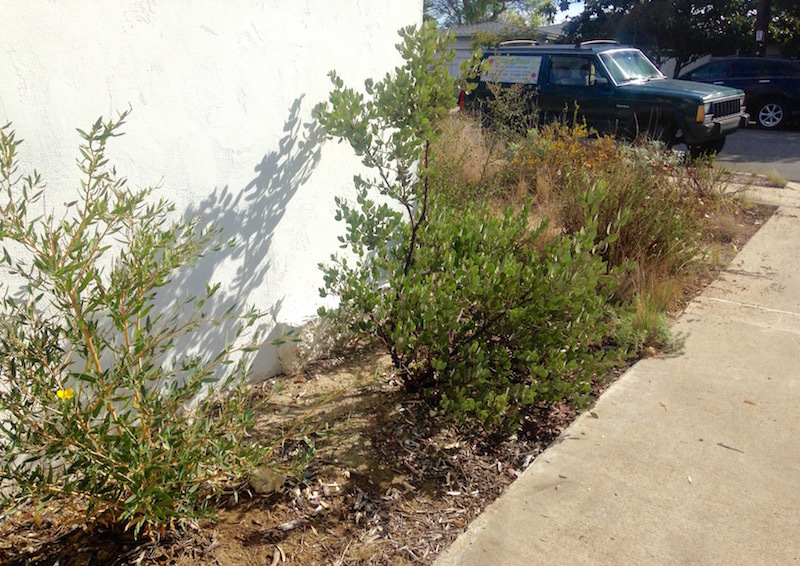 There is also an old large Schinus molle pepper tree on the other side of the driveway which could be another root competition cause for the stunted growth of the native plants. 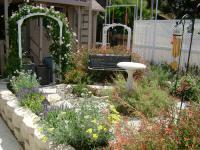 Although, two lemonade berries were planted right below the pepper tree and they both have grown well. 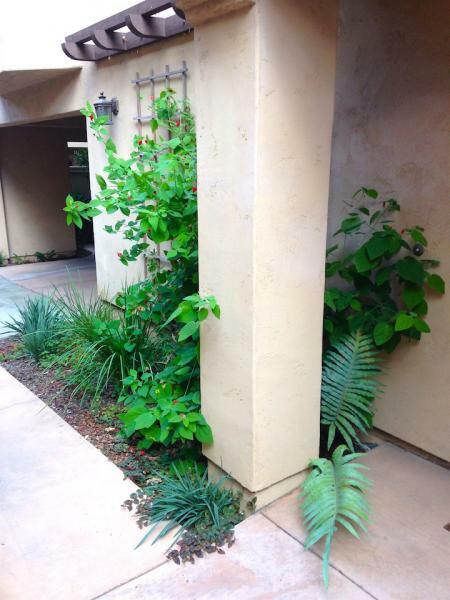 Acalypha actinophyla 'tree' with Hypolepis punctata ferns, in Del Mar, 2 years after installation. 2016. 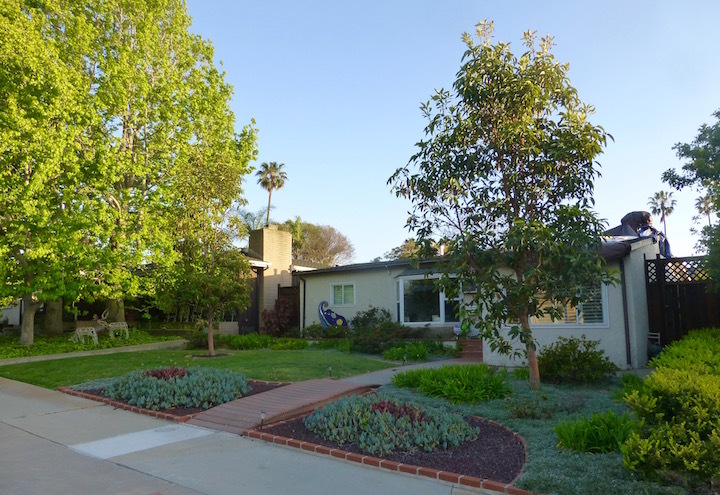 Other perspective of Del Mar property, from street. Pink groundcover is Persicaria capitata, other plants include Schefflera pueckleri, Philodendron 'xanadu', Fiesta Hibiscus, White Wings Hibiscus, Passiflora alata, Bougainvillea 'torch glow', Carex praegracilis lawn, Epidendrum orchid 'hot pink', three small mondo grass clumps, Hemerocallis daylily 'yellow', and the palms are Howea forseriana. 2016, two years after installation, except for palms being much older. 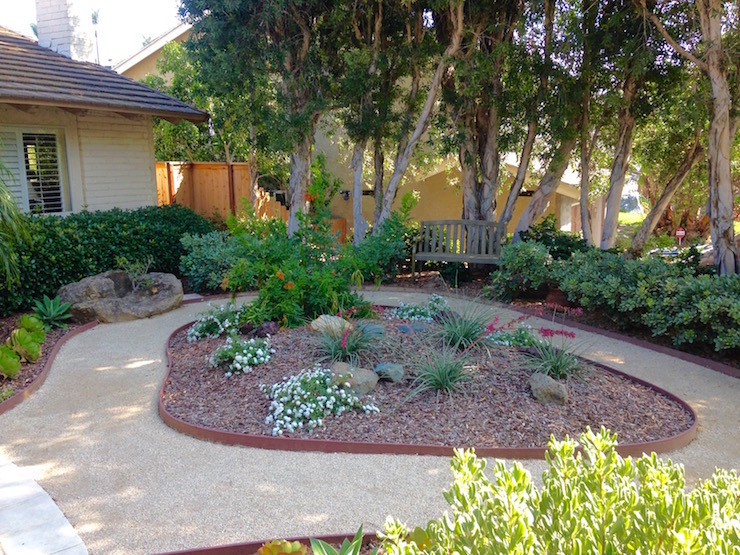 Allied Gardens neighborhood, summer 2012, a few months after installation, showing an entry way with south sunny exposure and north facing shady exposure. Using Hypolepis punctata fern on the sunny side, with Dypsis lutescens palm on both sides, Polypodium(Phlebodium) aureum fern on shady side. Some Viola odorata is at groundlevel on both sides. Showing front side of entry, with same three main plants as in photo 52. Phlebodium fern is between the Dypsis palm and Hypolepis fern, since the Hypolepis does better with more sun than the Phlebodium. Not easily visible in the photo is the fern Davalia trichomanoides at ground level on both sides of the Dypsis palm. 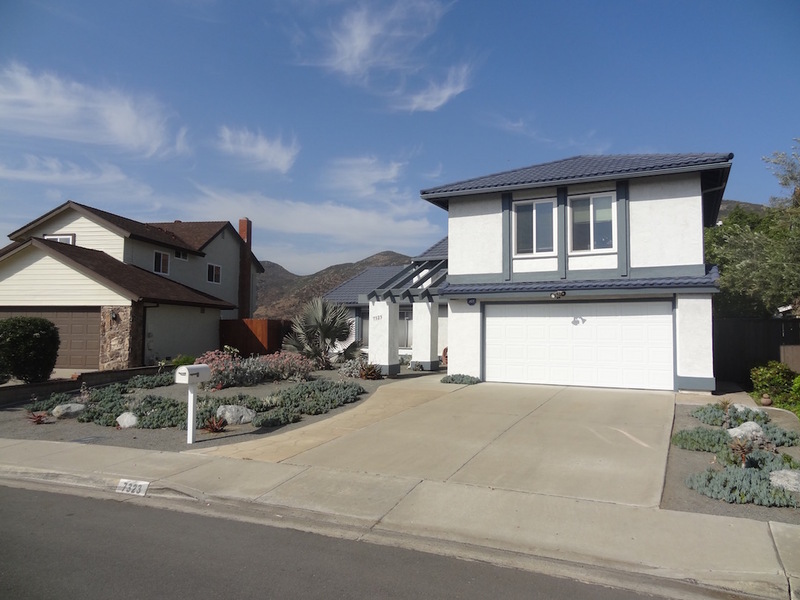 Spring 2018 new install, in San Carlos, near Cowles Mtn. Photo taken in August. 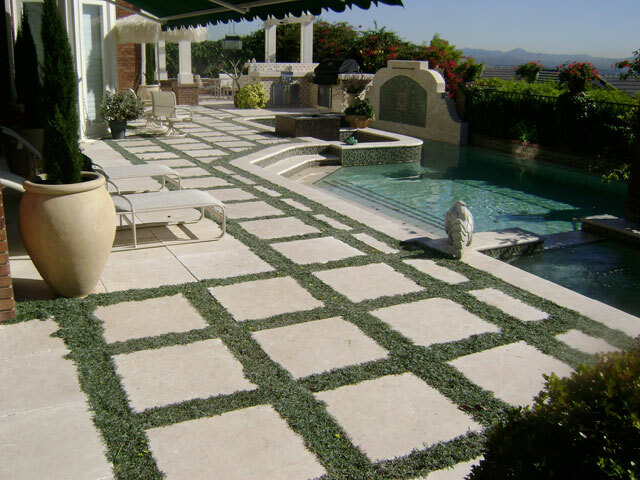 Decomposed granite patheways which are of 'stabilized DG', with composite bender board for the edging, and large flagstone 'bridge' which is reinforced with three length-wise 3/4" metal pipes and two end edge-length pipes, one at each end of the flagstone. Surrounding mature vegetation/shrubs were pre-existing. 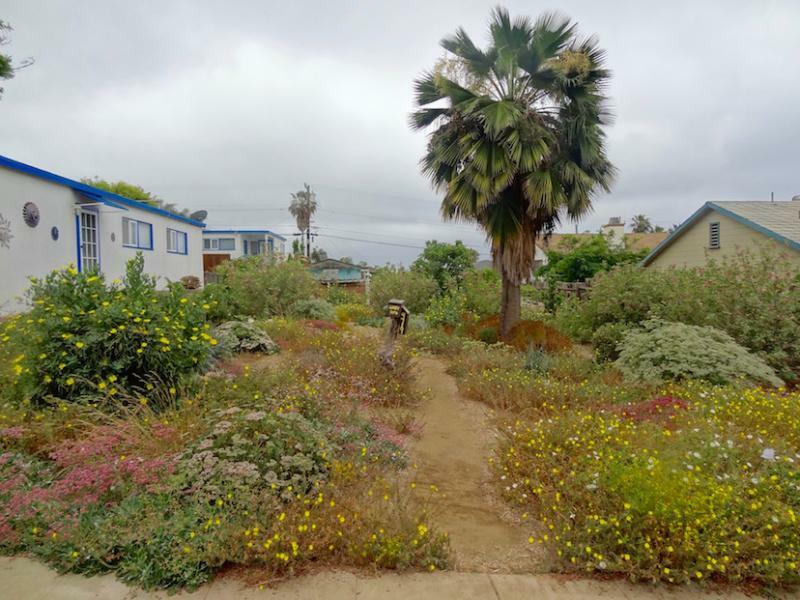 The San Diego natives which were planted include: one Xylococcus (Mission Manzanita), one Quercus dumosa (Scrub Oak), Salvia/Sage(with some hybrids), Mirabilis laevis, Trichostemma lanatum, Epilobium californicum, Toyon, Eriogonum fasciculatum, Sisyrinchium bellum, and Bahiopsis lanatum. The mulch used was a light layer of the '2" Mulch" from Miramar Landfill. The rocks used are from KRC Rock, Lakeside, - three different rocks were used. One type was mixed cobble stone, another type was mixed jagged, and the third type was the larger boulders of a different tonality. This composition has pretty darn good naturlistic habitat style character. New design-install, September 2012, of a relatively minimalist composition, but with very substantial growth development to occur as the plants grow through the years, and after a first season of weeding, will likely include the use of regionally native bulb or corm plants. Composed of already existing decades old Liquidambar trees at right back(which will be trimmed each June to keep in check, to minimize competition while still having a nice presence), and young plants of Dr. Hurd Manzanita, Del Mar Manzanita, Lester Rowntree Manzanita, Comarostaphylis diversifoila ssp. div., Lemonade Berry, San Diego/flat-top Buckwheat, Stipa lepida(grass), Epilobium californicum, and Juncus patens (rush). No irrigation system, just occasional hand watering is intended. 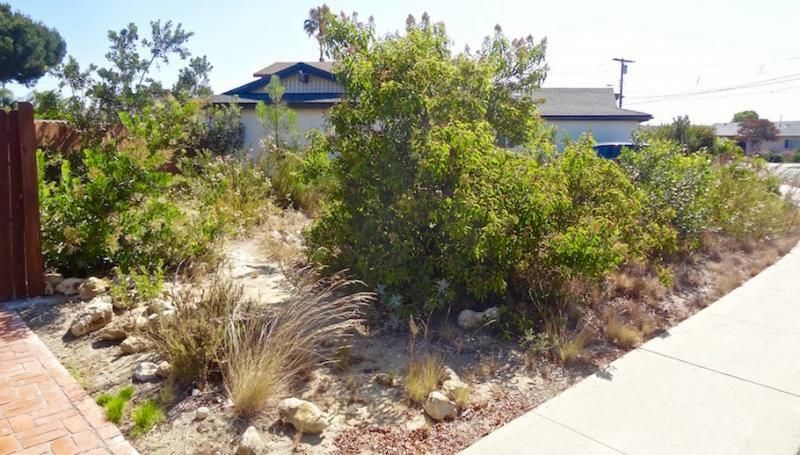 The intent with the soil contours and swales is to collect rainfall, and run-off from the adjacent concrete, and not have run-off from the property, in order to maximize use of rainfall within the landscape. A rain gutter will be put along the front of the house roof-eve, with the drainage shaft being at the right side corner of the house and will have an outlet at the beginning of the dry creek. Heavy rainfalls will then have water focused on going down the creek bed and into the creek end-pond-basin, which is at center within the space of the largest boulders. 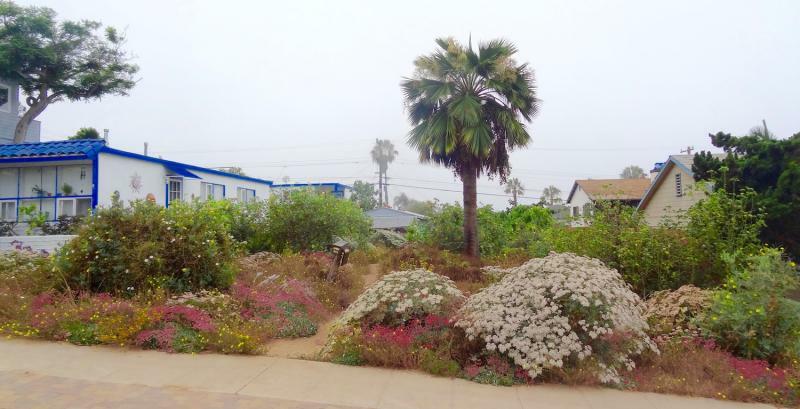 Photo below in July 2013, ten months later, showing the Epilobium and San Diego bush buckwheat in full bloom. Great red and white combo, where the Epilobium is planted in the lower elevation water catchment portions and the Buckwheat in the upper elevation portions. Owners have done some hand watering by hose since installation 'occasionally'. Green grass-like clump in front at right is Juncus effusus. Perspective from front door. Boulders and flagstones from KRC Rock Lakeside. Entrance to Southwest Boulder(for your rock, dirt, and paving supplies), east Pacific Beach/Bay Ho area. Rock-creek work by Advanced Waterscapes. New install. 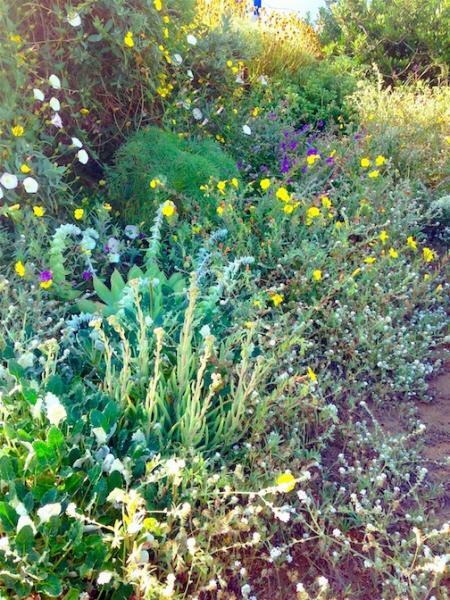 I did the plantscape composition, with all local regional natives, which are the following: Eriogonum fasciculatum(local buckwheat bush/San Diego/flat-top buckwheat bush), Laural Sumac, Toyon, Lemonade Berry, Jojoba, Epilobium canum, Bergerocactus emoryi, Dudleya edulis, Dudleya lanceolata, Dudleya brittonii(northern Baja Norte native, nearly the same habitat community as San Diego; the only one not native to San Diego used in the composition not counting the pre-existing Aleppo pines and iceplant in background). Photo below is of Bergerocactus emoryi and Dudleya brittonii, - a super duo matchup. 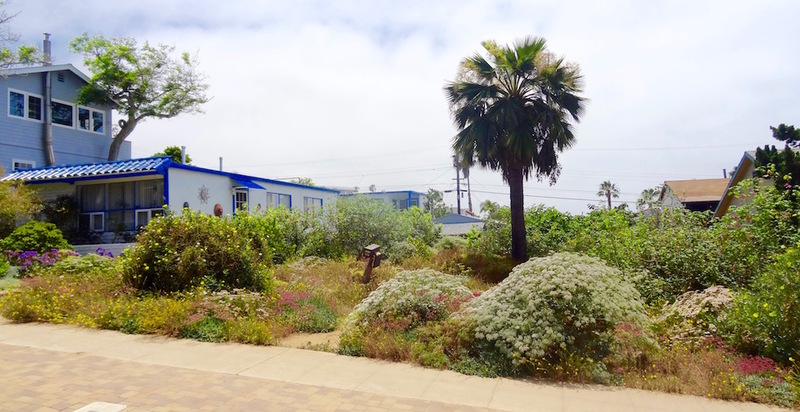 Also, as an artistic aside of concept, think of their use together as conveying a theme of 'The Jewel', a nominal theme I'm just making up in concept,.... with inspiration coming from their potential use in particular yet to be built native plantscapes in La Jolla. Design mainly by Nathan Smith in collaboration with the property owner, with my recommend-add-ons with a few of the plants used. 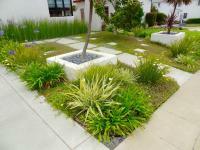 Lawn is Carex praegracilis planted 6" apart on diagonal arrangement. Irrigation for lawn is underground copper-shield-emitter dripline(to repel root intrusion into emitters) by Rainbird made with factory installed emitters at 12" intervals on the lines. The other areas are irrigated with dripline with emitters at 18" intervals about 18" between the lines. The other planted plants are an Acacia podalyriifolia tree(my recommend) by the house(blooms yellow flowers in winter), Pittosporum undulatum(pre-existing) hedge, Sedum 'Angeline' with Aeonium 'Cylcops' and Aeonium 'Kiwi' (change of my recommend), Lomandra longifolia 'breeze', Euphorbia characias ssp. wulfenii, Phlebodium pseudoaureum blue dwarf fern(my recommend) below-front of Pittosporum hedge, Blue Fescue amongst the fern and the Euphorbia, Vitex trifoliata 'purpurea' with Sedum 'Blue Spruce' amongst them, and Echevaria 'After Glow' with one Lomandra in their midst. Blue decomposed granite patio in middle and 'Storm Mountain' flagstone both from Southwest Boulder. Steel border edging from Ewing Irrigation. Trees in front are Acacia stenophylla. Point Loma, 2013. Next two photos are one year later, 2014. 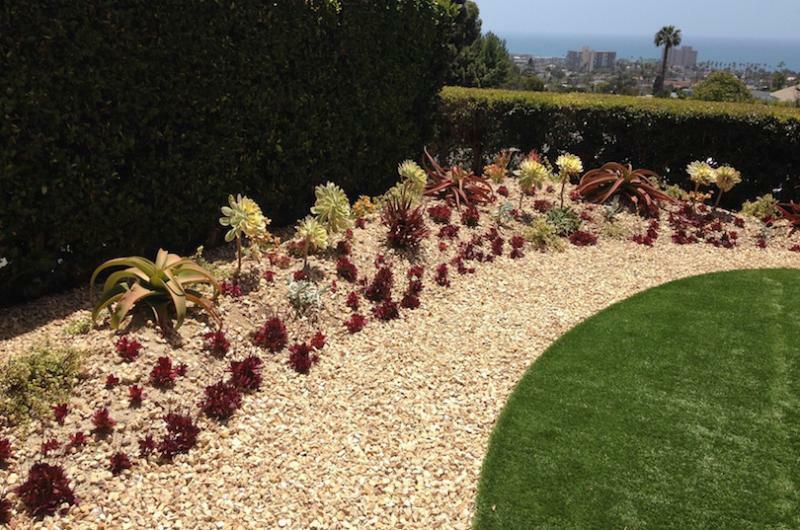 Turf space primarily planted with Phyla nodiflora, which can make a good lawn,.. watering usually no more than once per week during the warm majority of the year. It's moderately walkable. Pt. Loma, spring 2015, planted 2014. 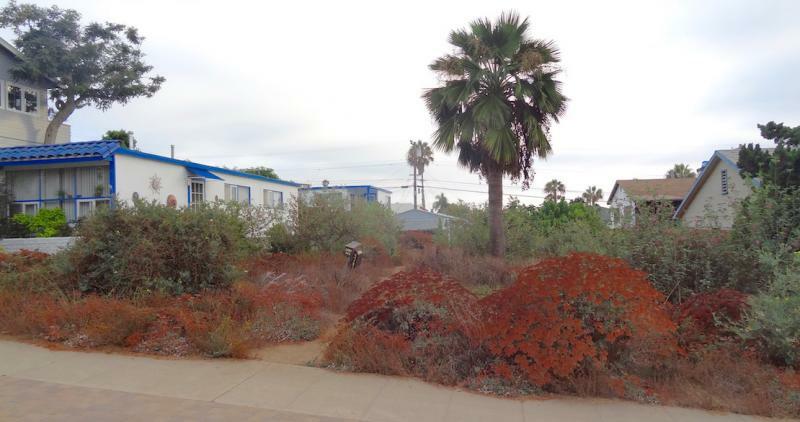 [Magnolia, Cordyline(dark brown), and Agapanthus already present on site]. 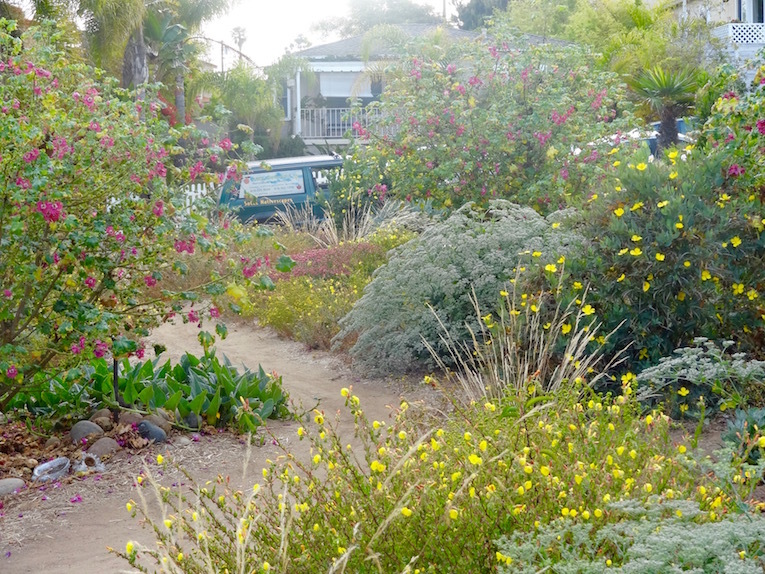 Early June 2013, SoCaL coastal islands and coastal mainland cottage garden composition. 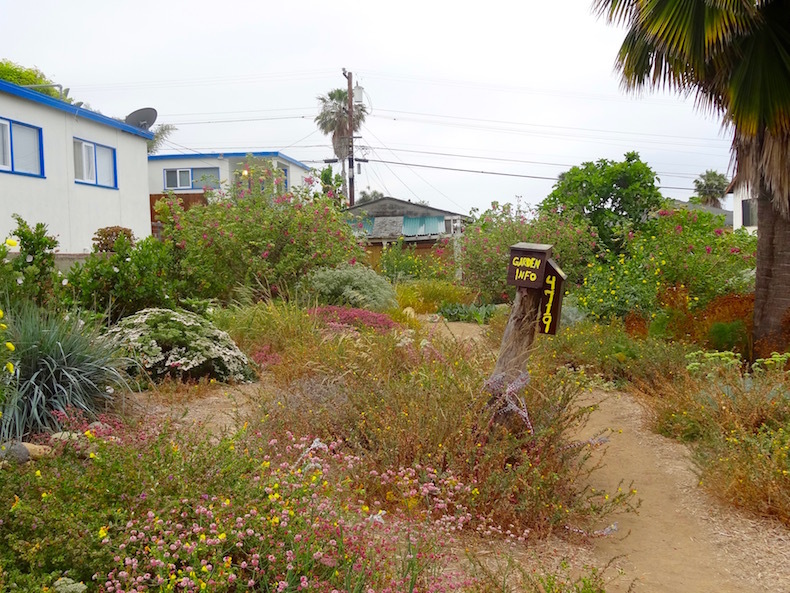 Late May 2013, SoCaL island endemics and coastal mainland natives cottage garden. Early June 2017. 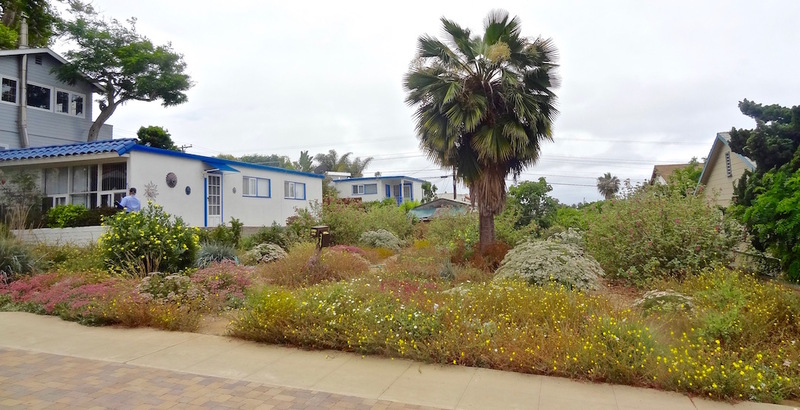 Southern California coastal floristic province select plantscape, with emphasis on SoCaL Islands endemics. White flowers are Eriogonum arborescens and Eriogonum giganteum. Rouge flowers are Eriogonum grande rubescens. Yellow flowered bushes are Dendromecon harfordii. Larger bushes in background are Malva assurgentiflora. Palm is Brahea edulis. Photo below, two weeks later. I installed, along with labor-helpers, from prep through installation and finishing, the beige-ish pavers in the parking strip, in October 2013. September, 2014. I installed, along with labor-helpers, the beige-ish block pavers in the parking strip, from prep through installation and finishing, in October 2013.